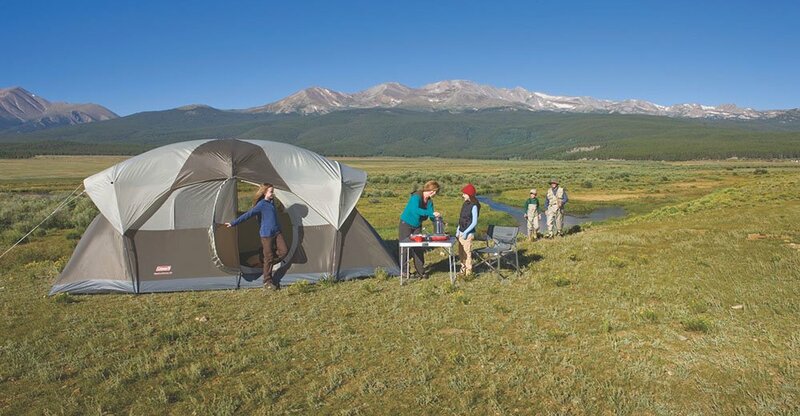 When we go camping we like to try and get the whole family in one tent if possible. 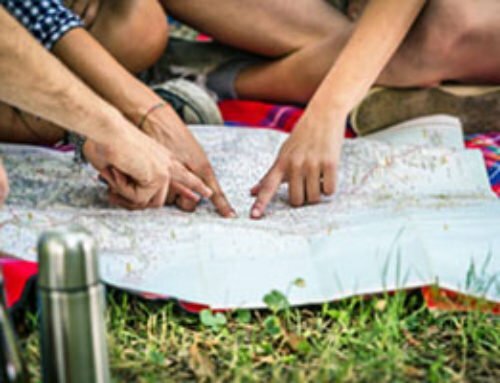 Ultimately, that shouldn’t be too difficult since there are only 5 of us and many tent manufacturers make 5 and 6 person tents, right? 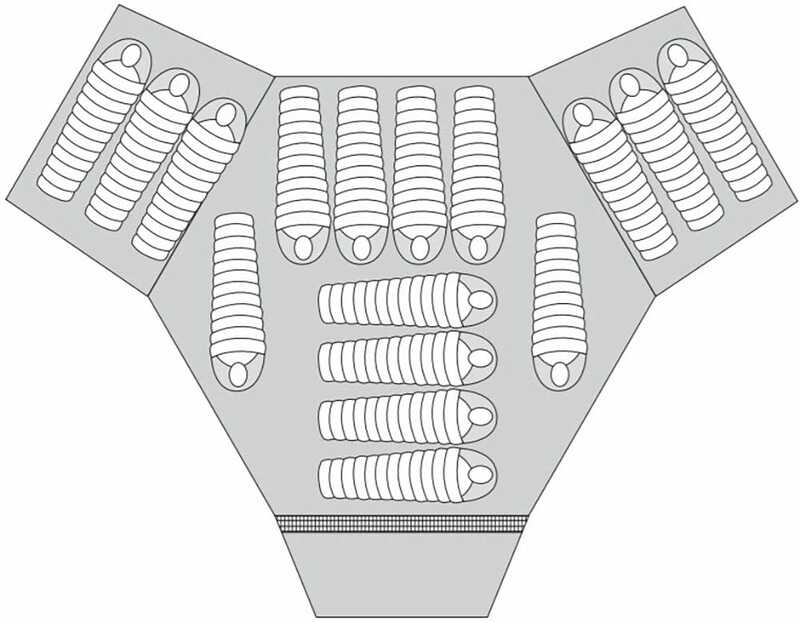 Wrong, when they say it’s a 6 person tent they mean 6 people sleeping right up next to each other with basically no extra room for gear. 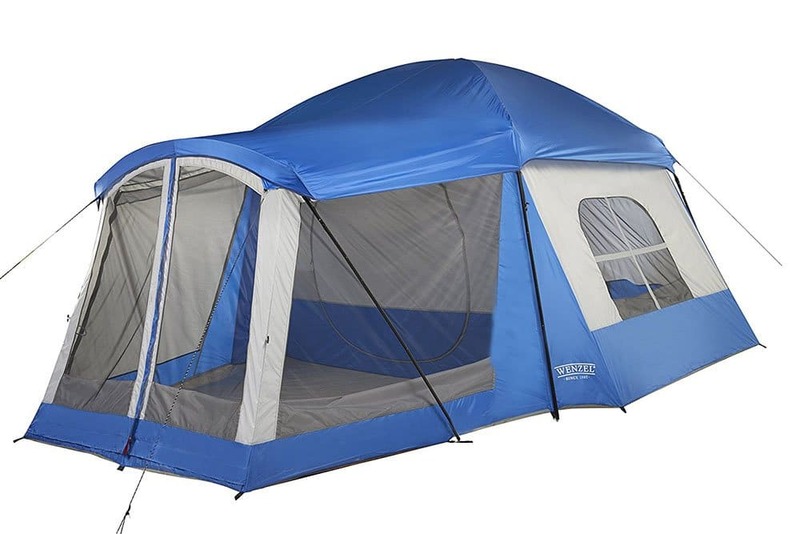 My rule of thumb is to get a tent that is double the size of what it says you need. 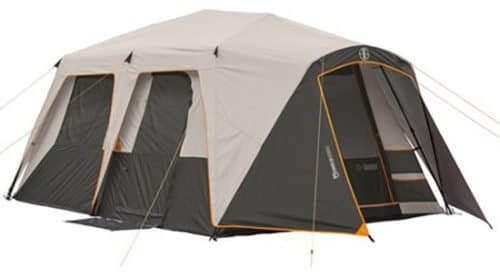 So with 5 people in our family, we are looking for at least a 10 man tent. 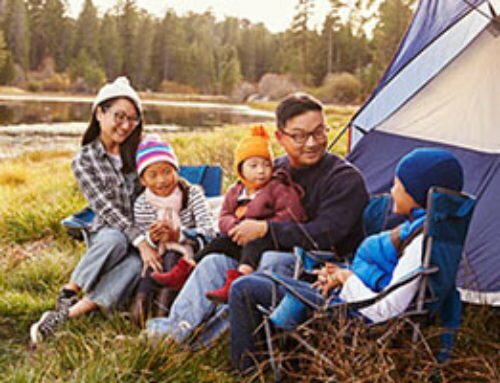 Additionally, we sleep on cots, which end up taking more room, so we look for the largest family camping tents that don’t cost a fortune. 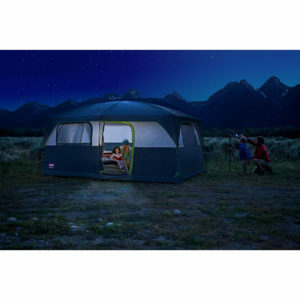 Ozark Trails’ 20×10 Dark Rest Instant Cabin tent is an awesome large family camping tent. 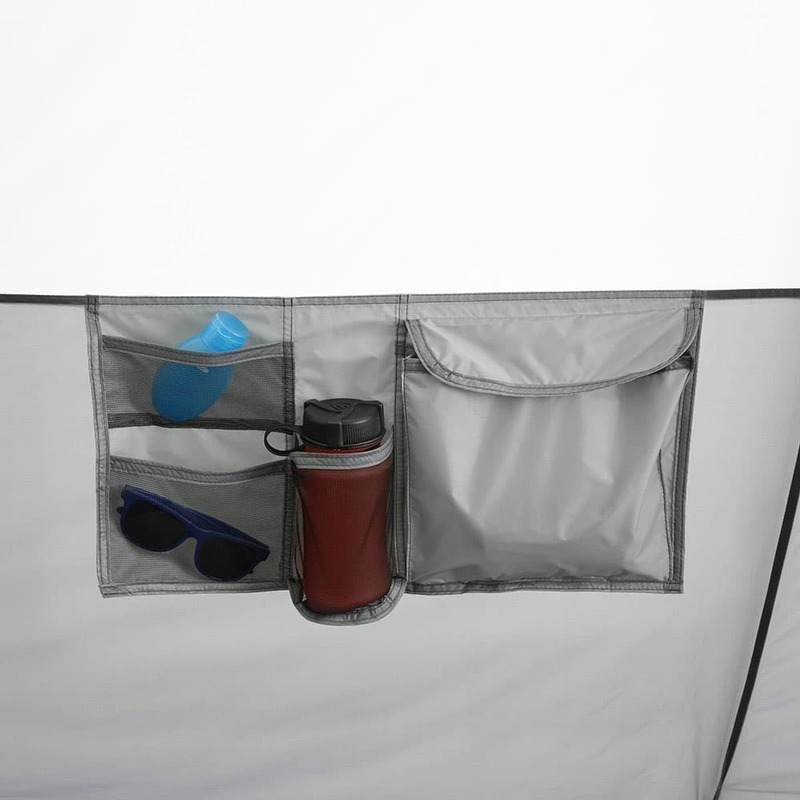 It offers lots of space with the added benefit of sun blocking technology. 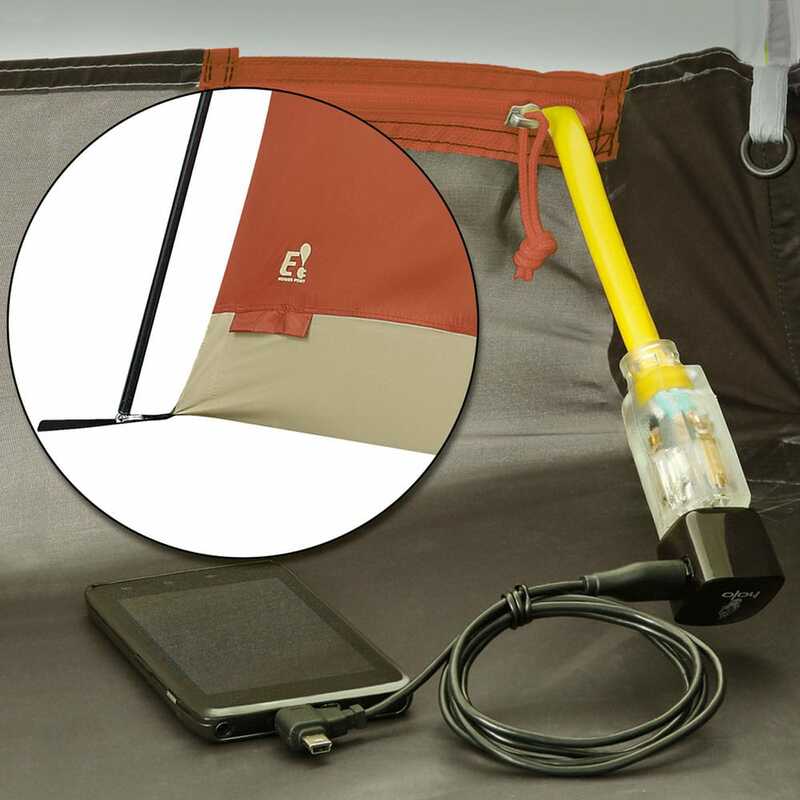 This stent is very easy to set up. 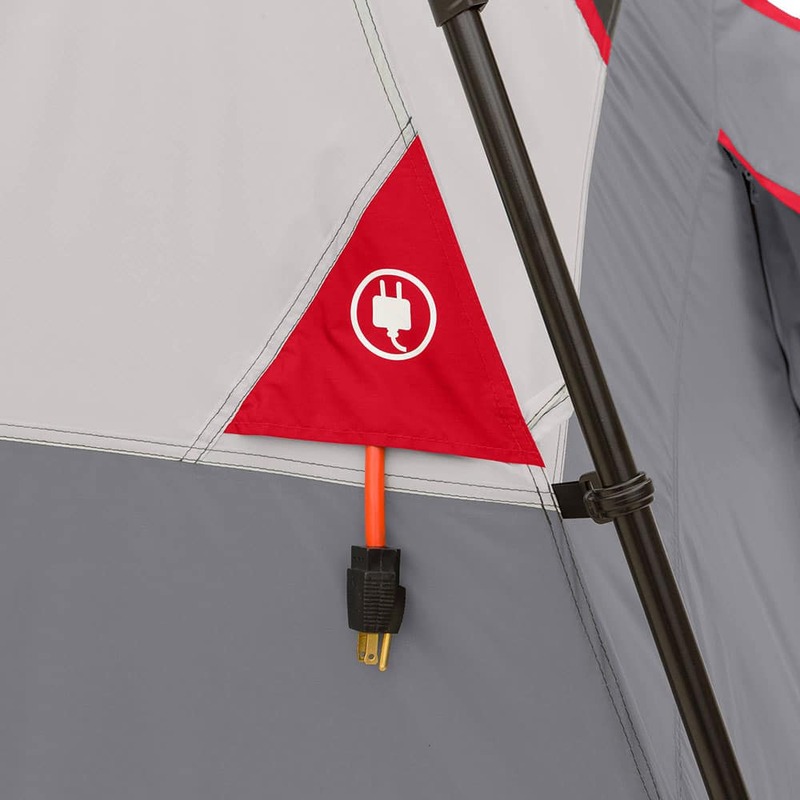 You don’t have to worry about getting the poles in the right places as all the pole remain attached to the tent. 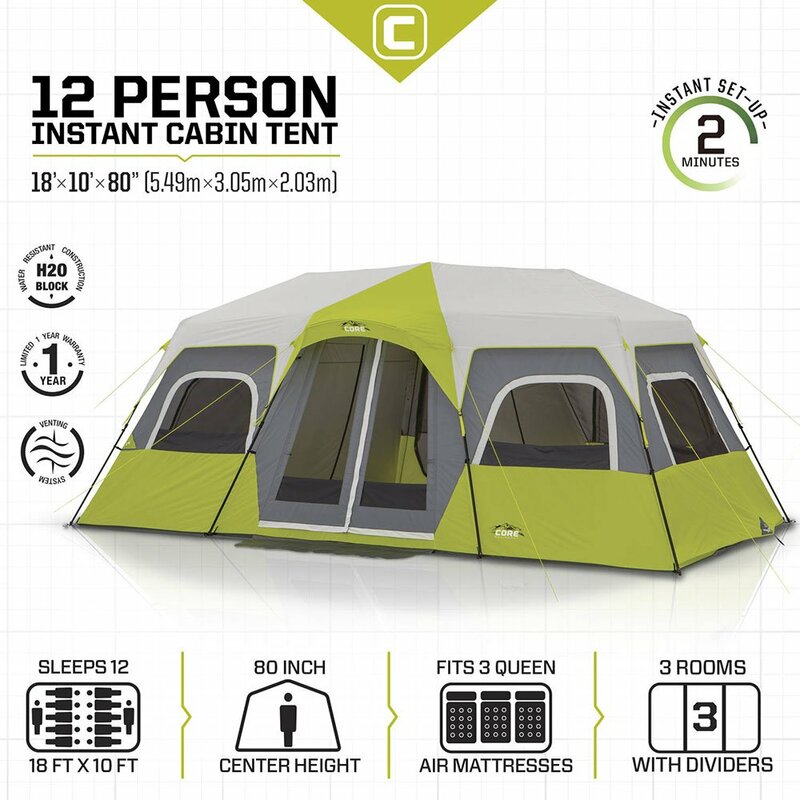 This tent sleeps up to 12 people, has 2 room dividers, and can fit 4 queen mattresses. 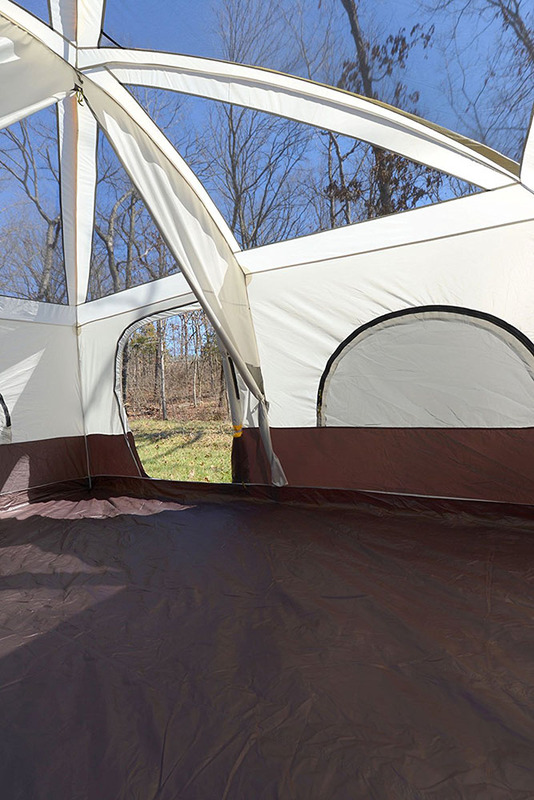 This tent also has multiple skylights so if you like star gazing at night this might be a great option for you. 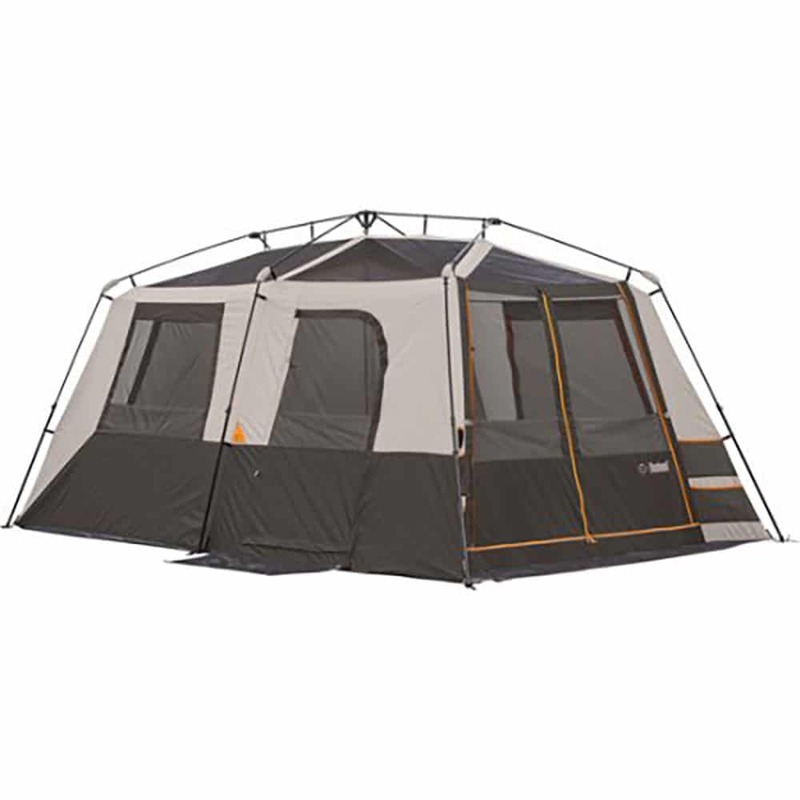 Core’s 12 person 18′ x 10′ camping tent is a great option for large families. 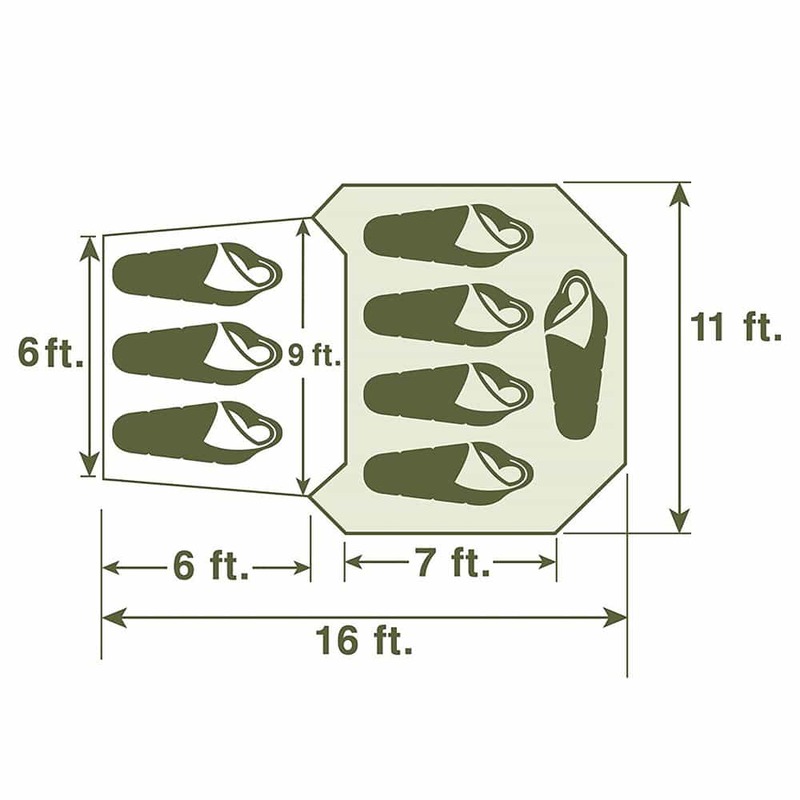 This is an instant cabin tent meaning it is very easy to set up. 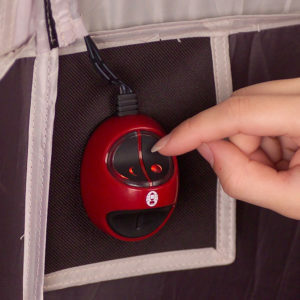 The description says it can be set up in as little as 2 minutes. 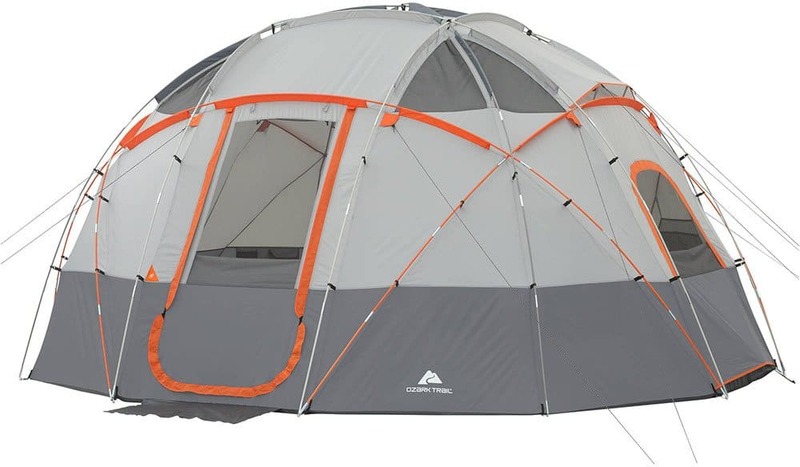 Coleman’s WeatherMaster 10-Person tent is an awesome large camping tent. 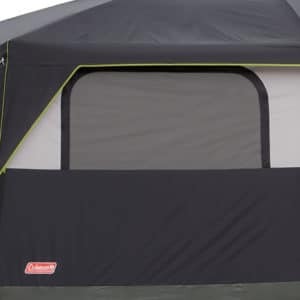 At 17′ x 9′ this tent is not quite as big as some of the other tents on this list but still offers a lot of space. 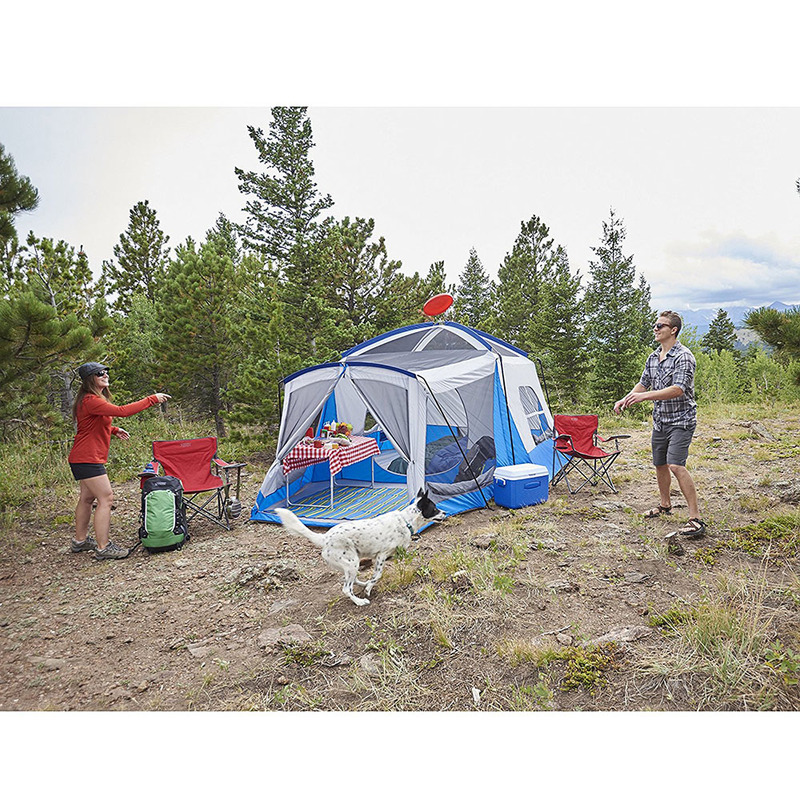 Coleman offers some extra features that other tents don’t have making it a great option for families looking for a well built dependable tent. 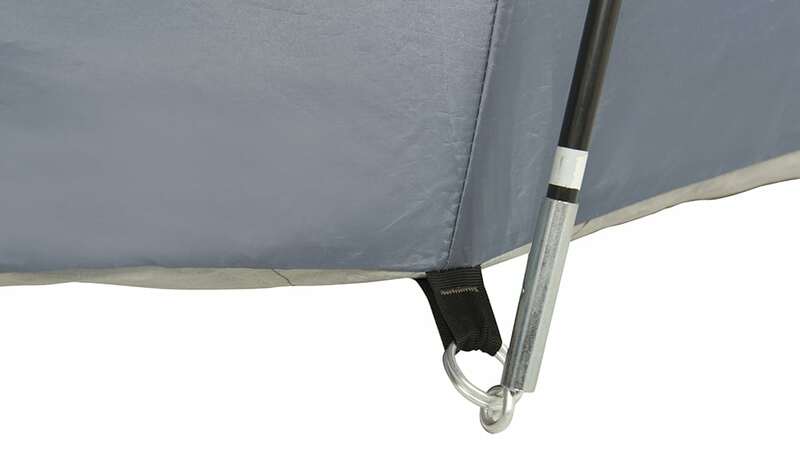 This tent is not an instant tent but is still easy to set up in 20 min or less. 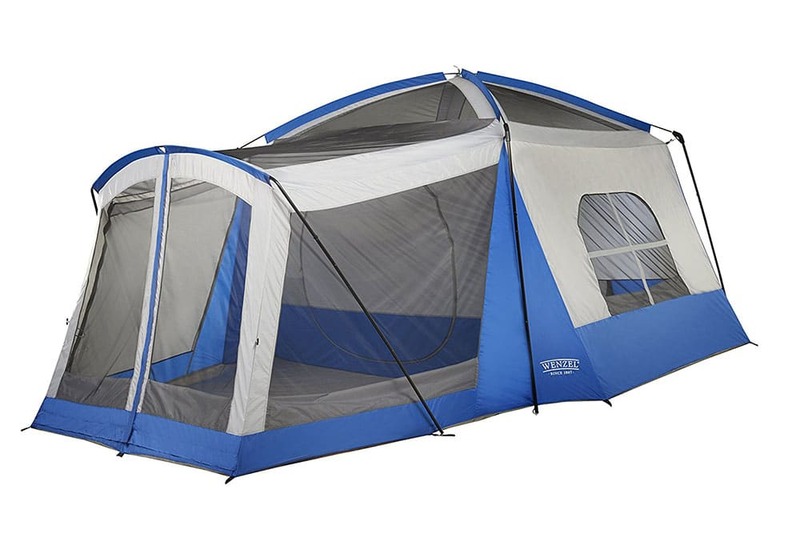 This tent wins the award for the largest tent on the list. 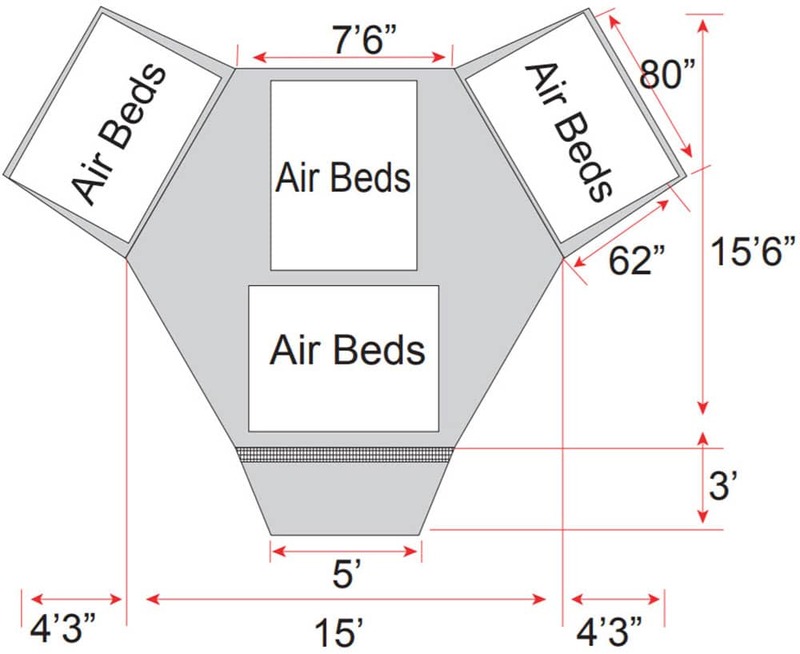 The floor measures 25′ x 21.5′ with a square footage of 283′. 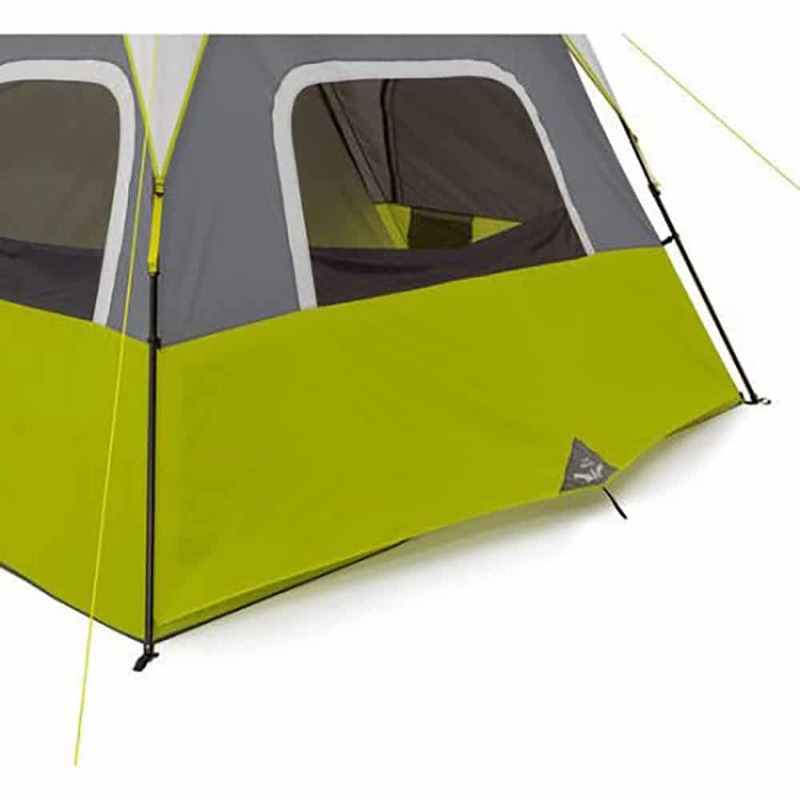 This camping tent has a Y shaped design and can fit up to 20 people in sleeping bags. 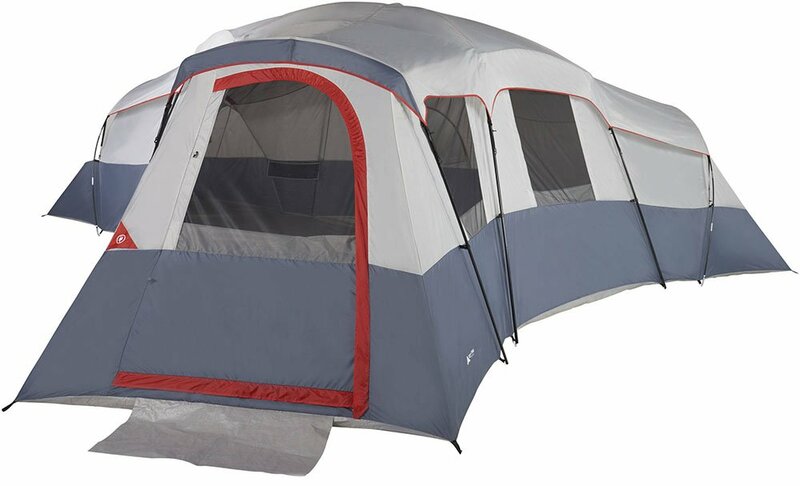 I have personally set up one of these tents and it was a pretty easy process. The first time I set it up I did it alone and it only took me about 30 min. 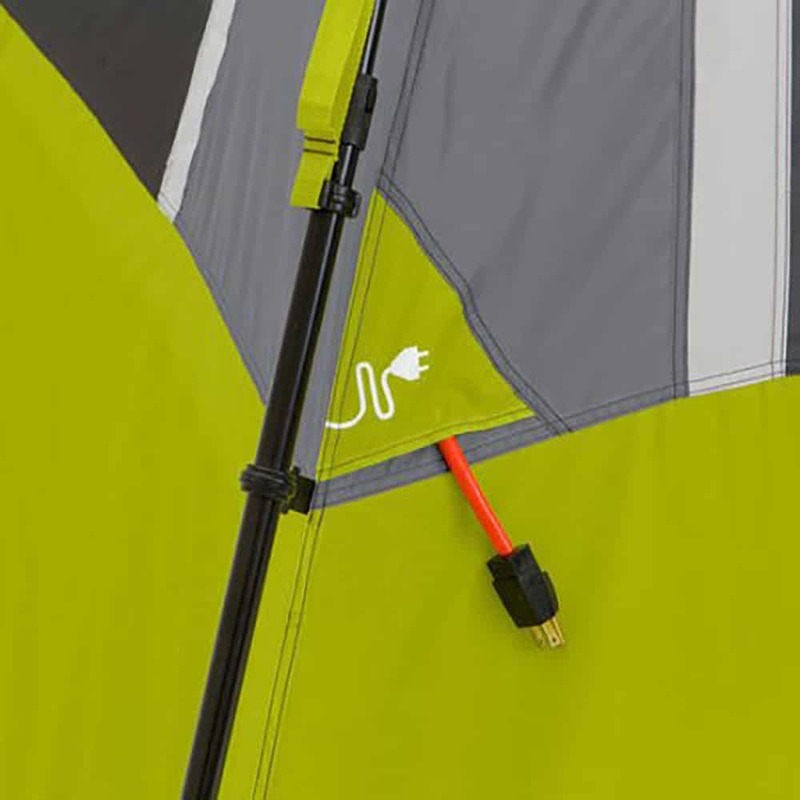 With 2 adults you can easily set it up in under 20 min. 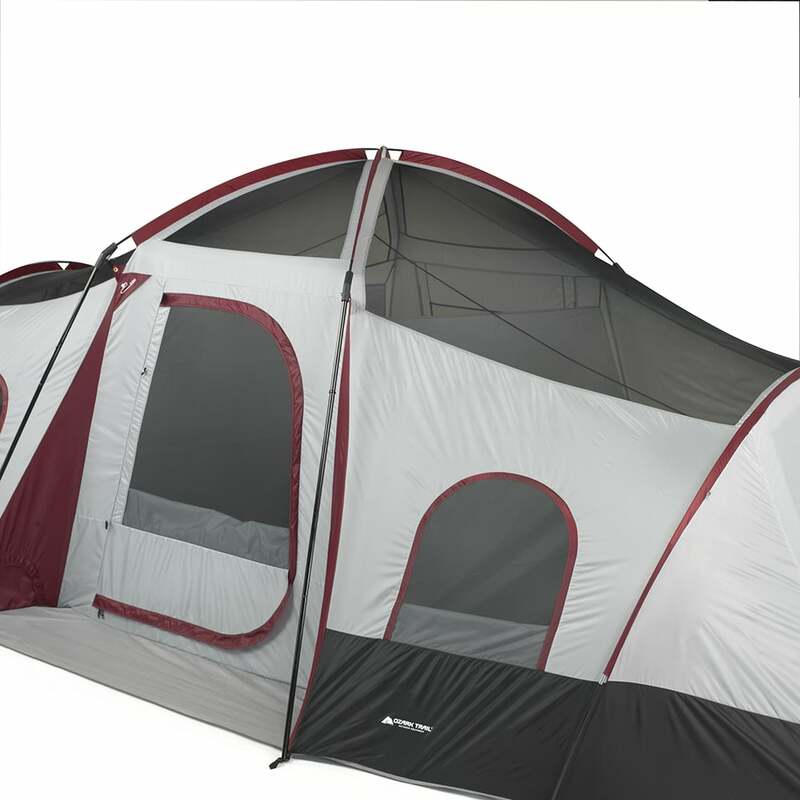 This is a seriously large tent and if you are wanting the most space you can get, this is the tent for you. 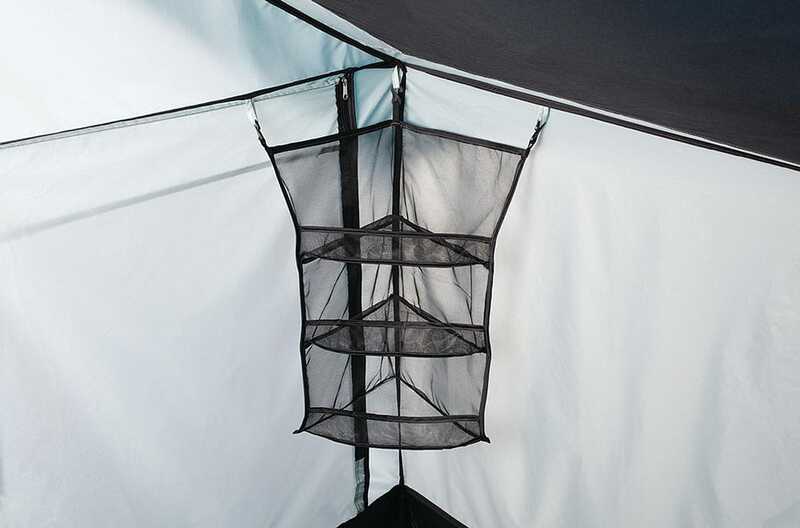 The roof is mesh allowing for great ventilation but it does come with a rain fly that covers all the mesh and keeps rain from getting in the tent. 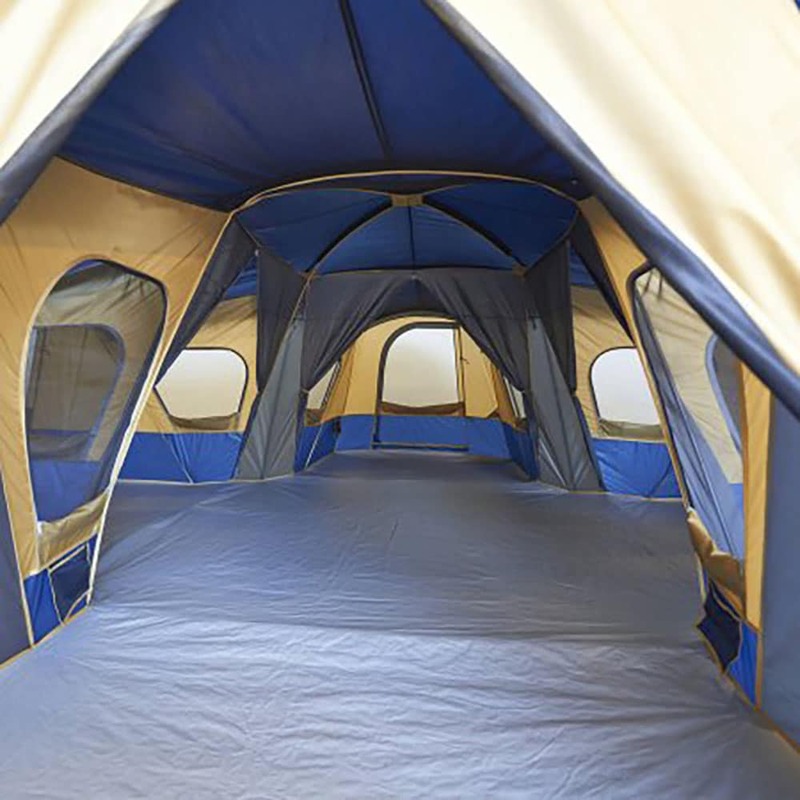 This 20 person tent can also be split into 3 separate rooms with the included room dividers. 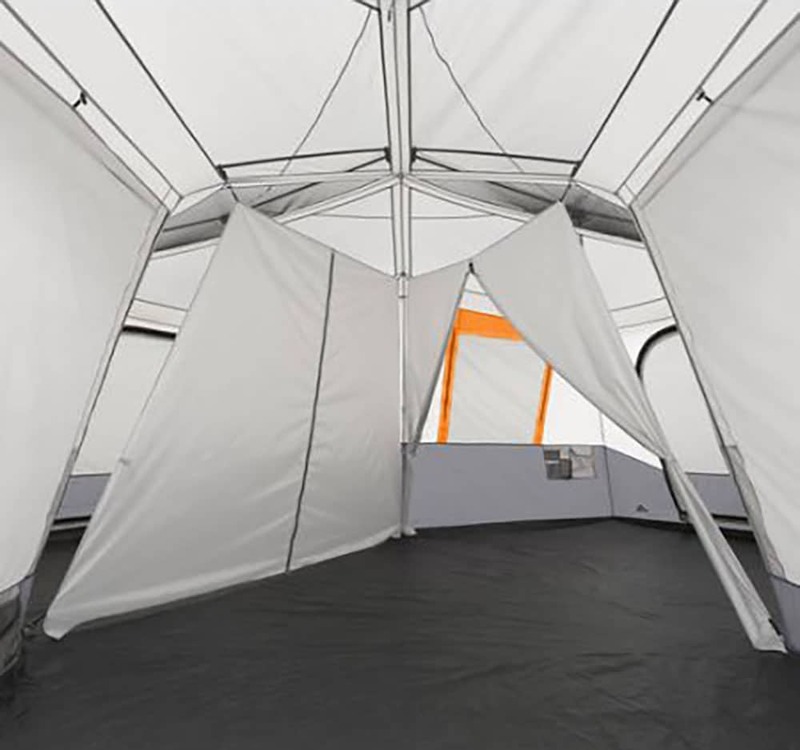 The tent has 3 separate entrances and so each room has its own door allowing for an extra level of privacy. 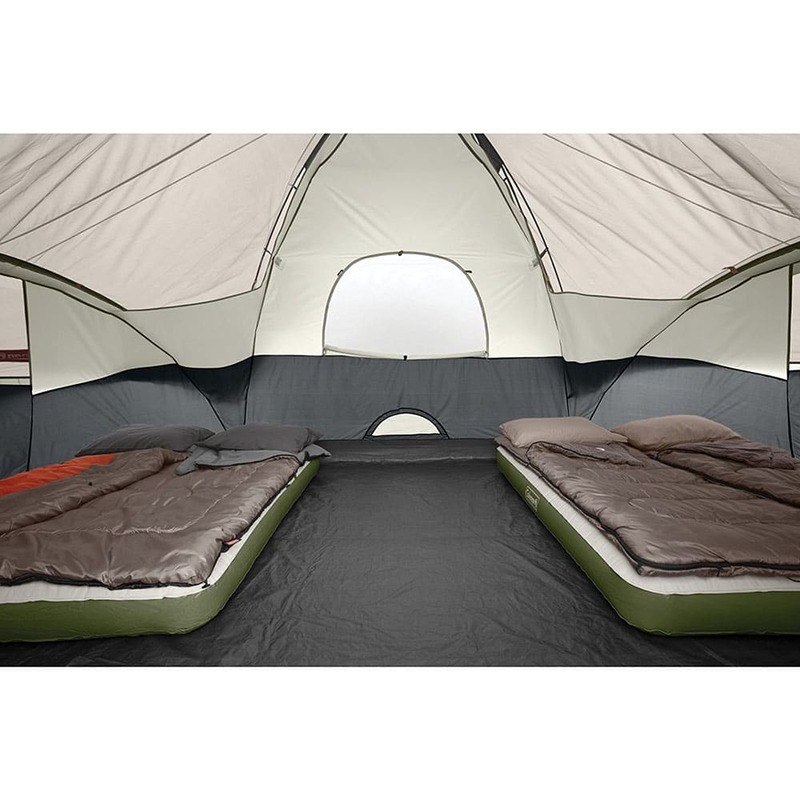 Ozark Trail’s 16 person tent is a slightly smaller version of the 20 person tent. 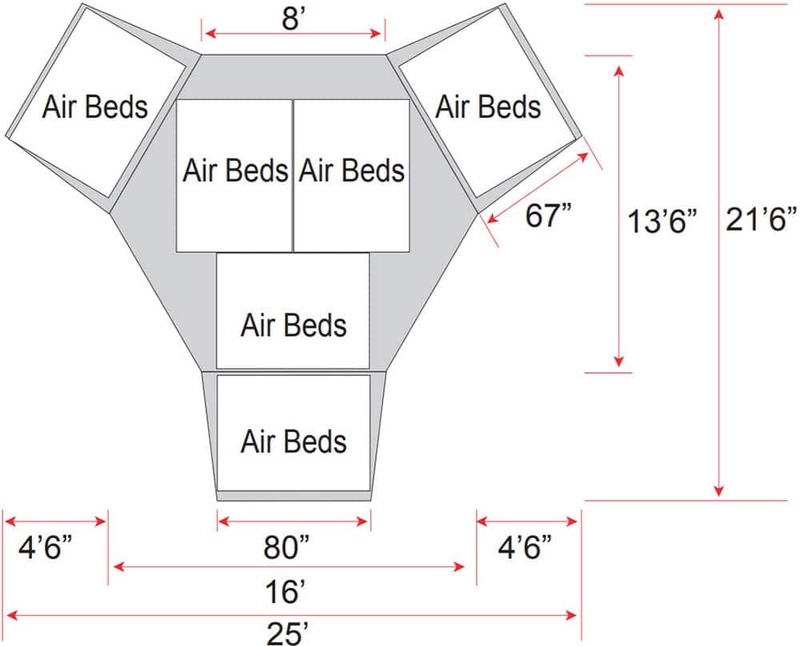 The layout is a similar triangle shape with 3 entrances and can be divided into 4 separate rooms. 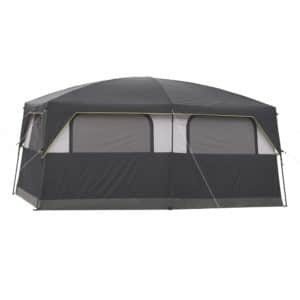 Unlike the large 20 person version, this tent has a protected entry that helps prevents any rain from entering the tent. 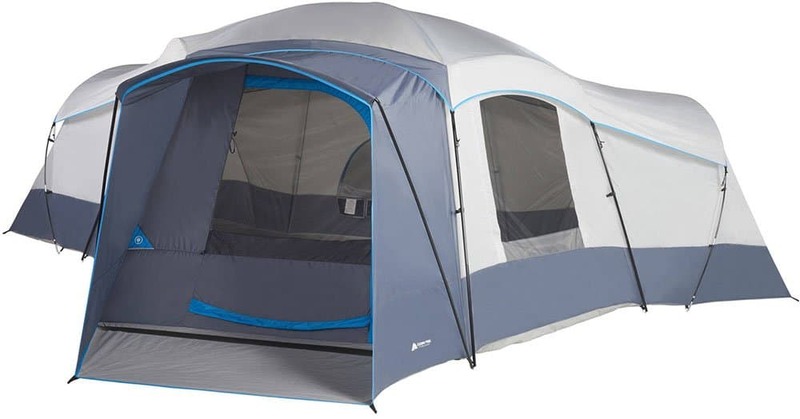 This is not an instant tent so it will take about 15 minutes to set up with 2 people. 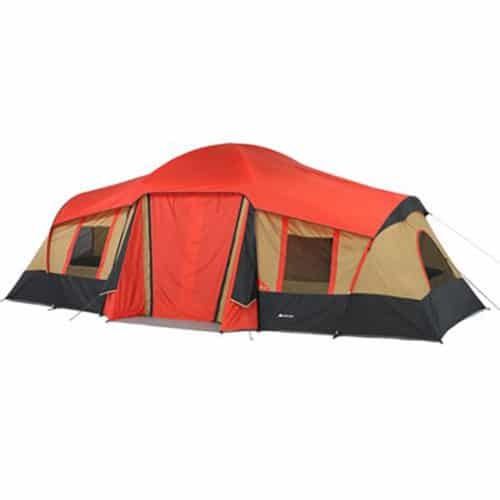 With a floor space of 240 sq ft, this is a very large tent that can easily fit many people. 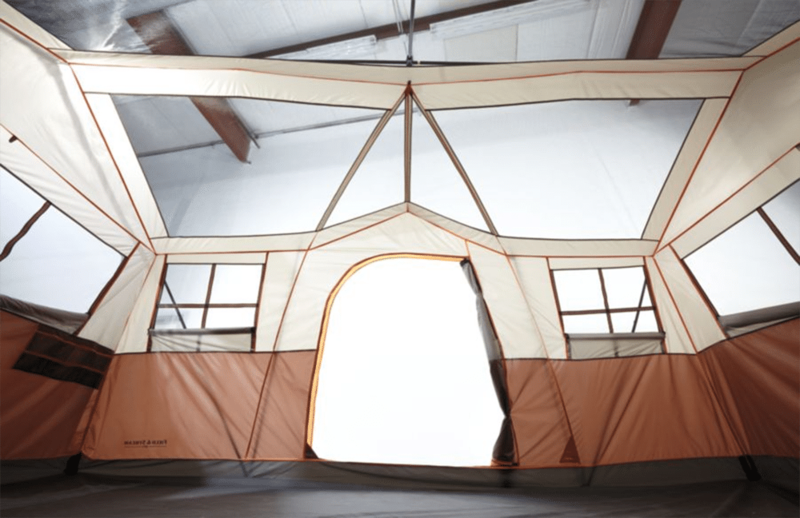 Northwest Territory’s Grand Canyon is a large tent that gives you more of a feel of a home than a tent. 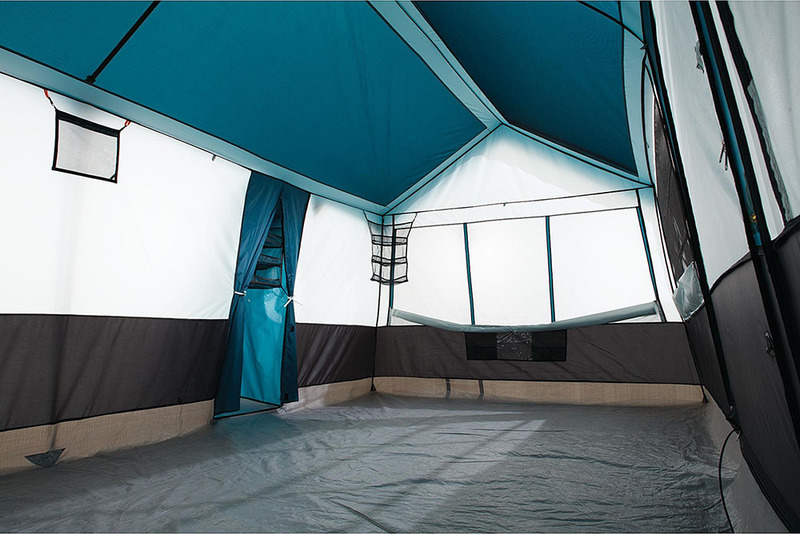 With floor dimensions of 20′ x 12′, there is lots of space even for a large family. 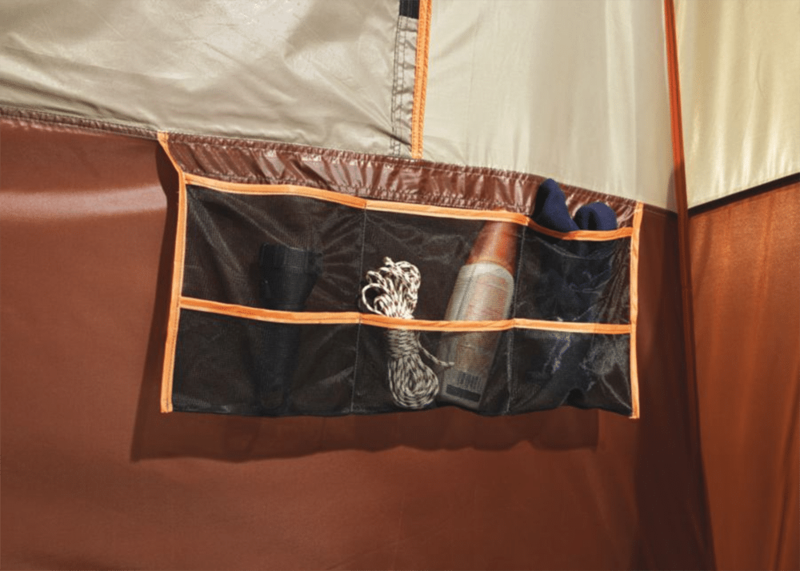 One nice feature that the Grand Canyon provides, which many tents don’t, is 2 full-sized closets to help keep you organized. 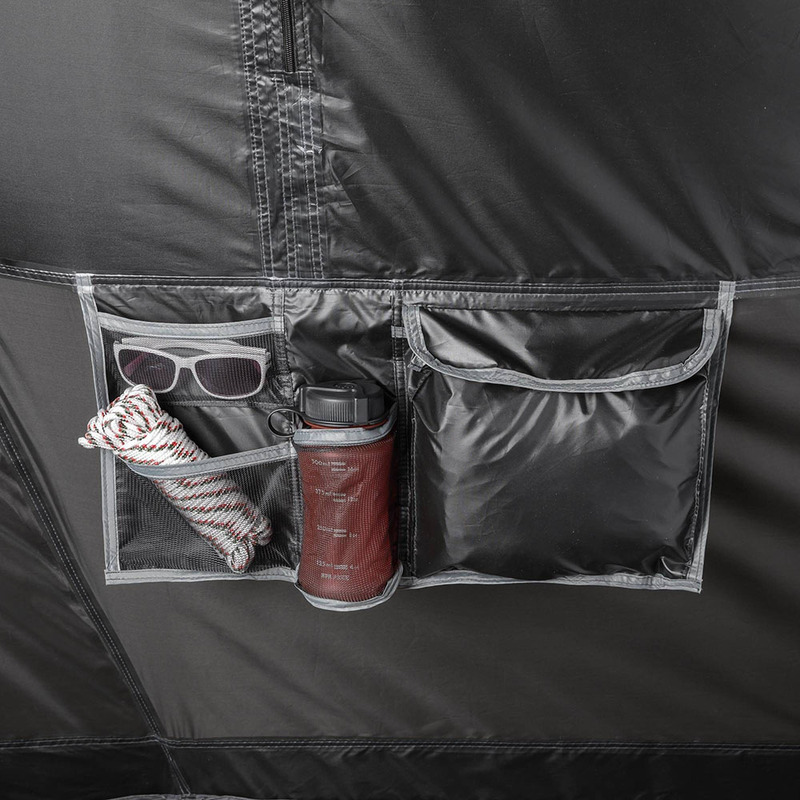 With the size and storage, this tent will help any family stay organized. 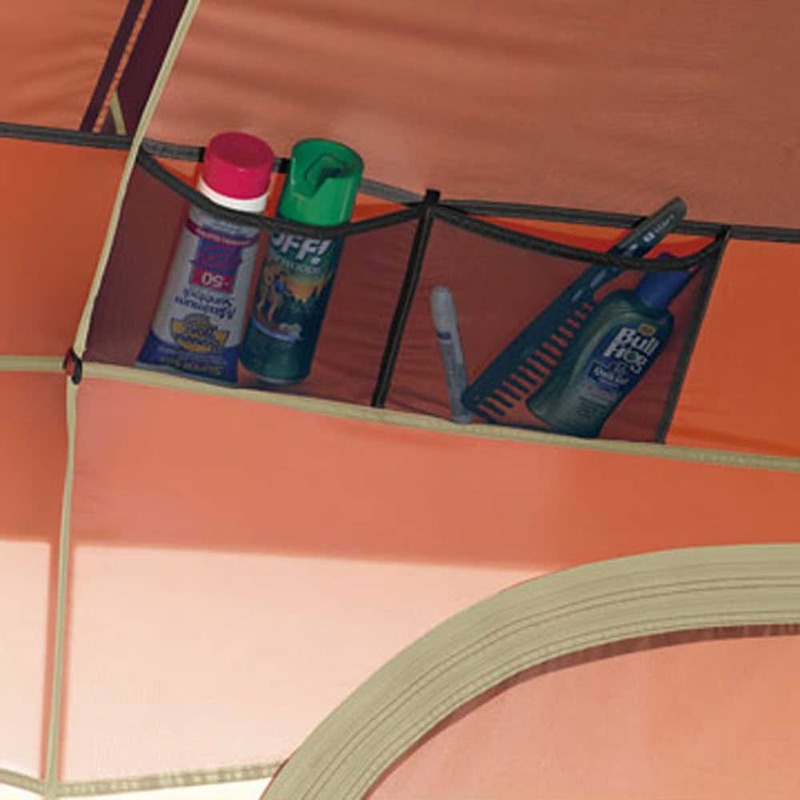 This tent does come with a rain fly but it does not extend very far down the sides. 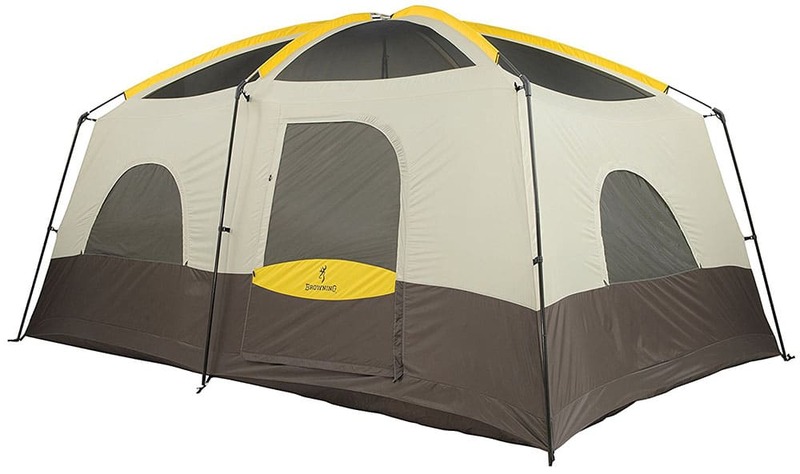 This would be a great large family tent for situations where you were not planning on having poor weather and lots of rain. 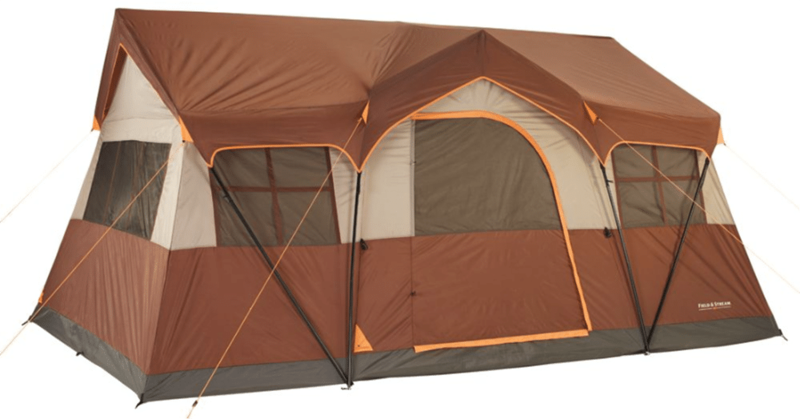 Eureka’s Copper Canyon 12 person tent is an awesome and well made large camping tent. 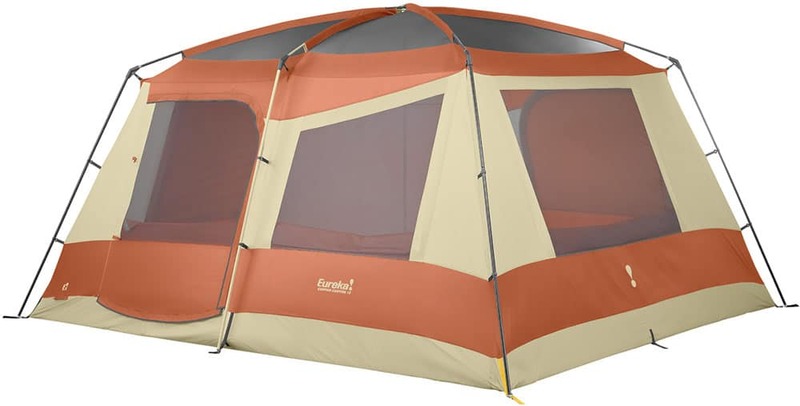 I have had Eureka tents in the past and have always liked them. 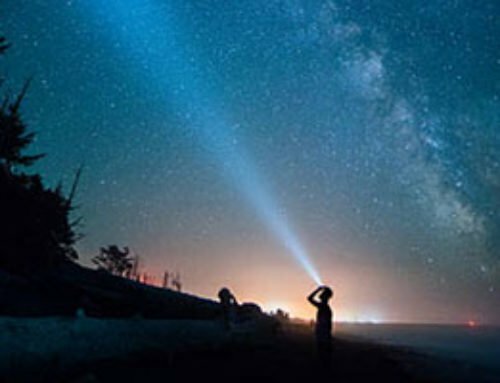 They are made well, with solid material, and do well in more extreme weather. 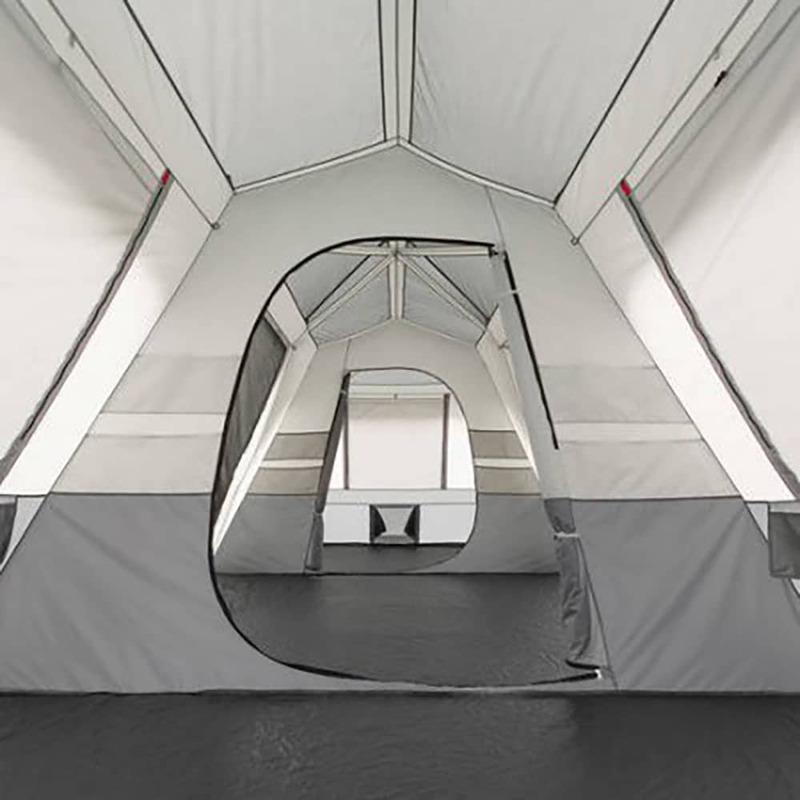 This tent offers 2 separate entrances with a room divider providing privacy and convenience. 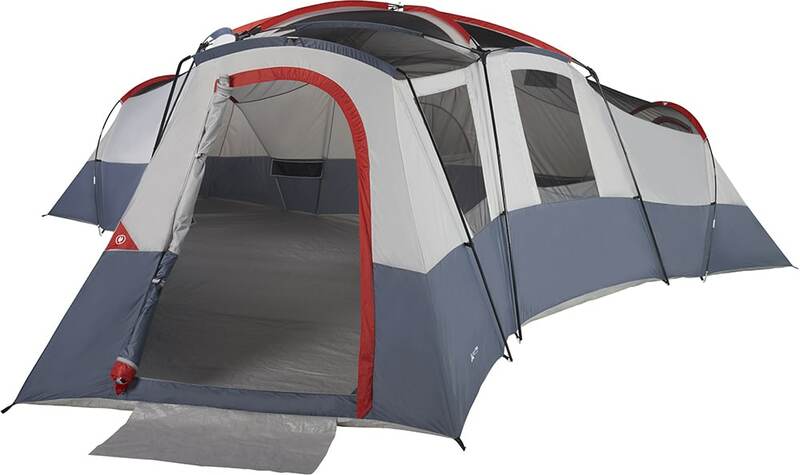 With floor dimensions of 14′ x 12′, this is not the largest tent but it will still accommodate 12 people. 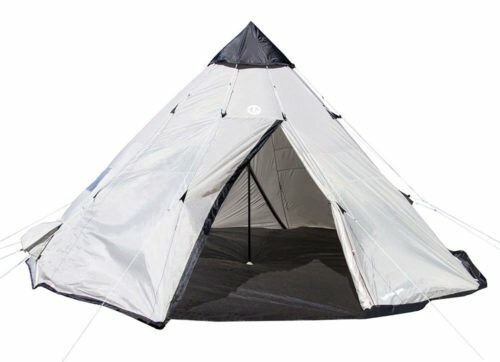 If you are looking for a solid well-built tent that doesn’t have to be the biggest on the market, this is a great option for you. 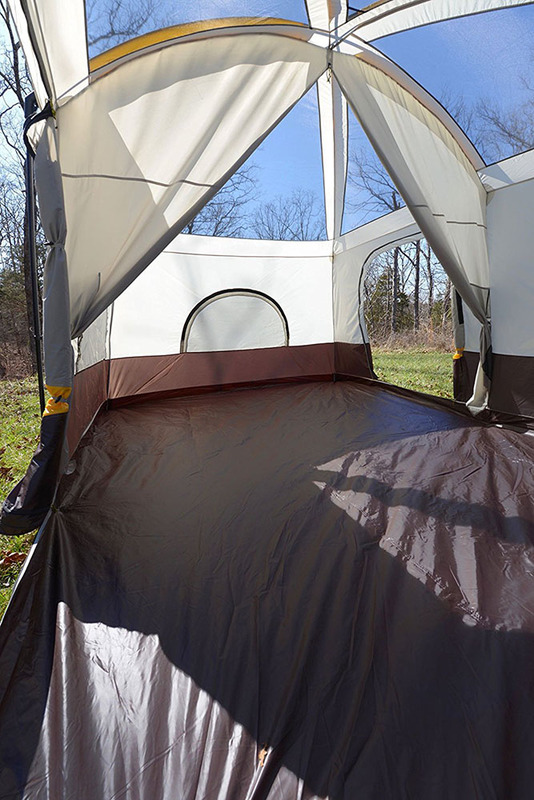 This Ozark Trail is one of the largest instant cabin tents on the list. 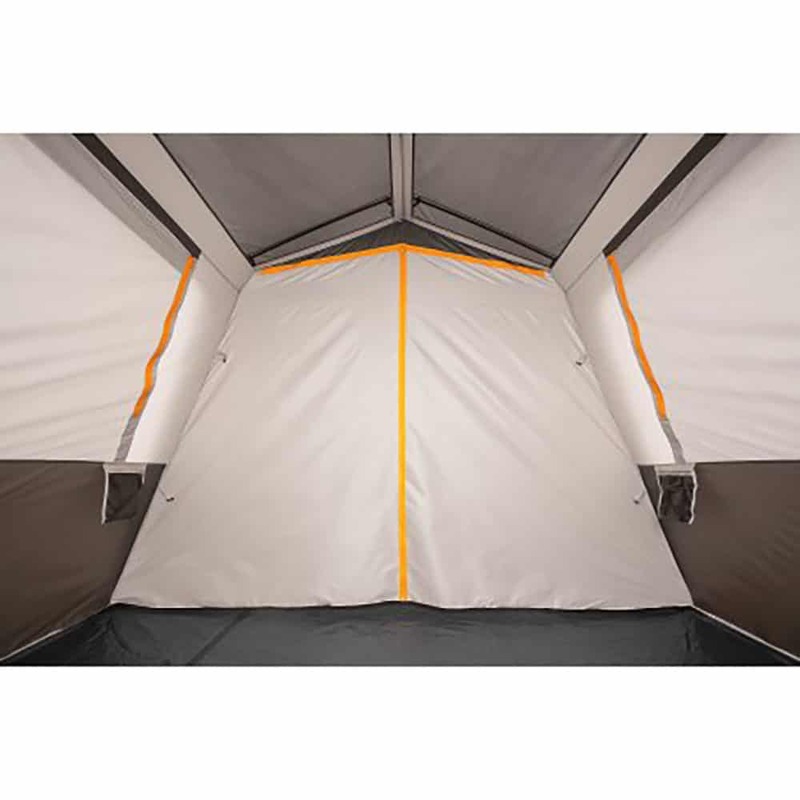 It provides 250 sqft of space with 2 sewn in room dividers. 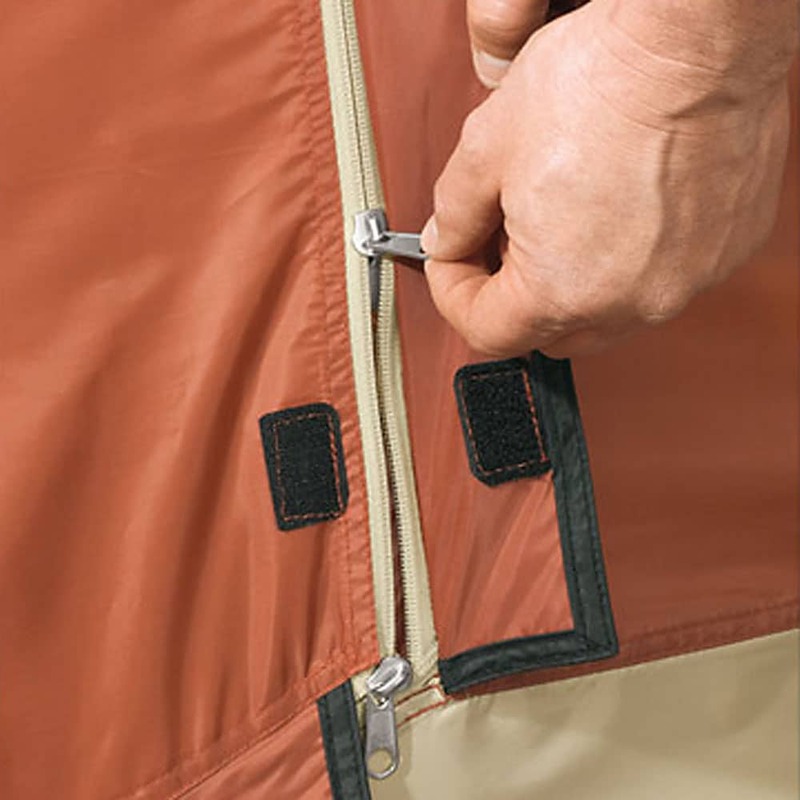 These sewn in dividers help the different sections/rooms really feel like separate rooms. 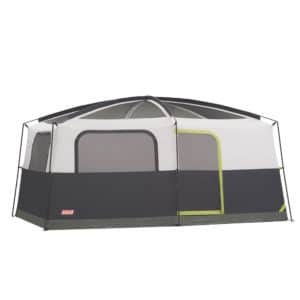 This is a great tent for families or large groups that like to have more privacy but still want to be in the same tent. 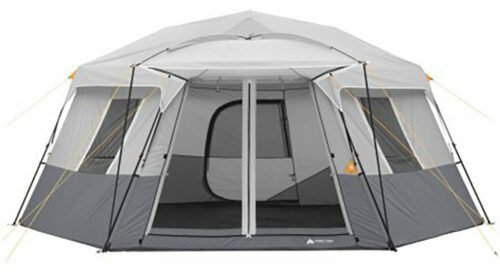 This large camping tent can fit 5 queen air mattresses and can fit up to 15 people. 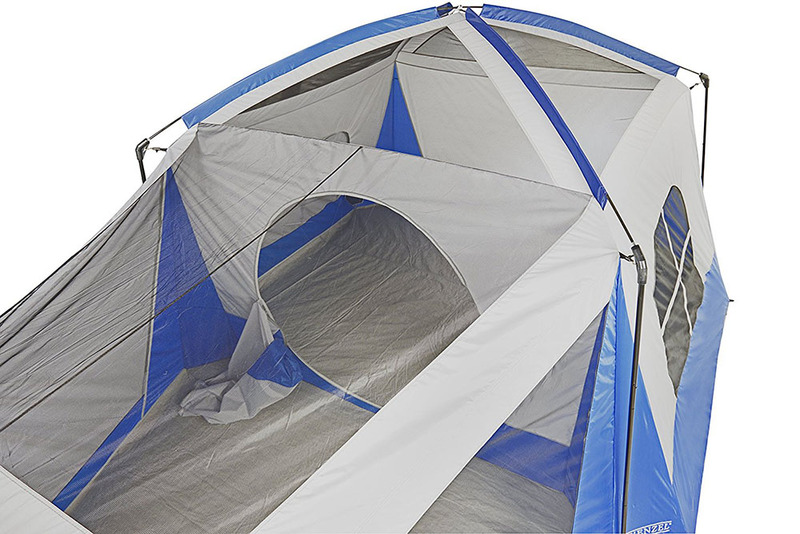 With a center height of 84″, this tent can fit even the tallest of campers. 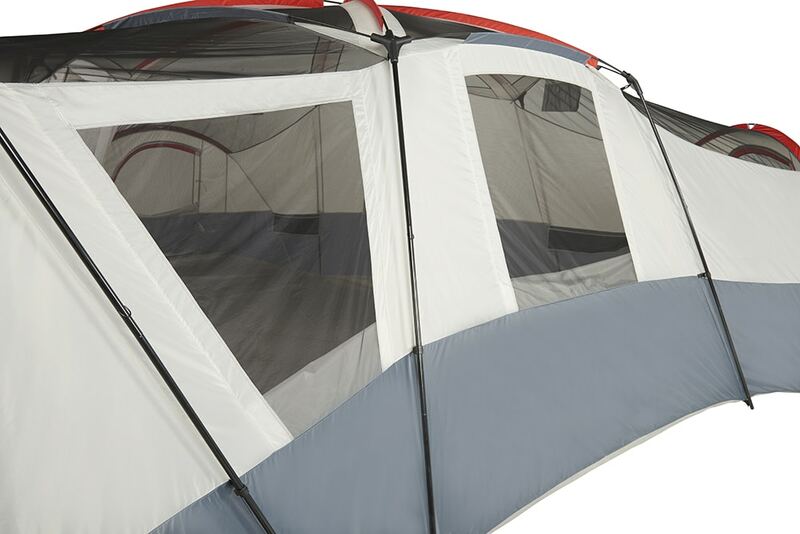 Additionally, this tent has an attached awning that is great for keeping your entrance dry and shaded. 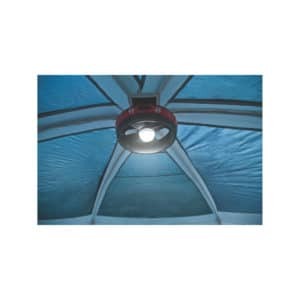 Ozark Trails 16’x16′ Sphere Tent is a great option for large groups or families. 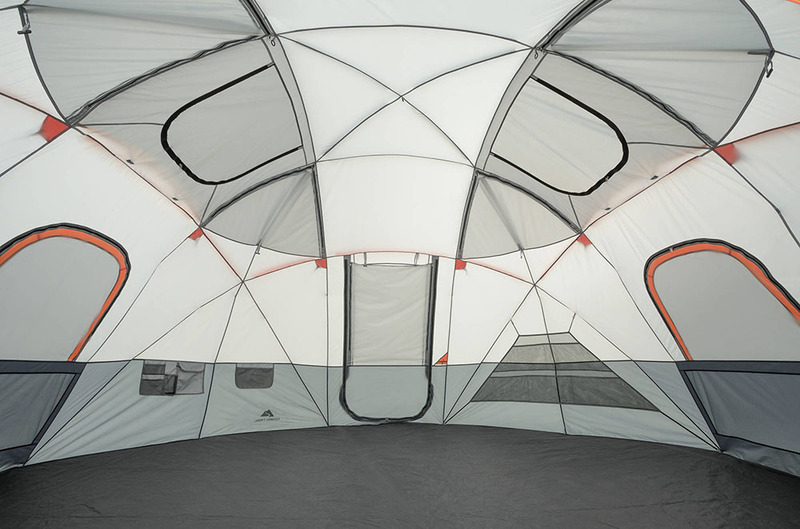 This is a dome style tent that offers a lot of space. 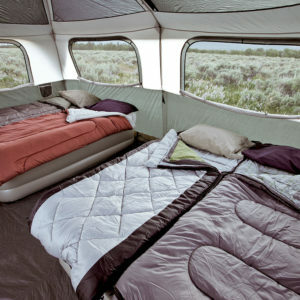 It can fit 3 queen air mattresses or 12 campers in sleeping bags. 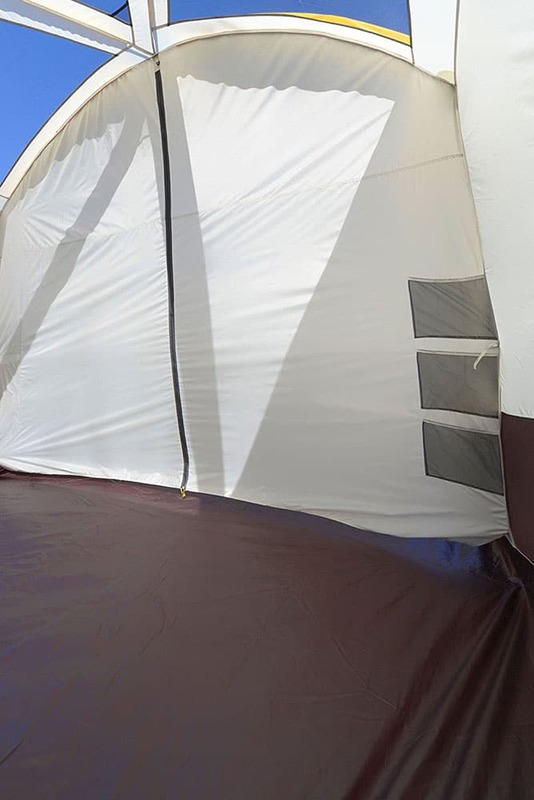 The center height of the tent is 92″, which makes this tent one of the tallest tents on the list. 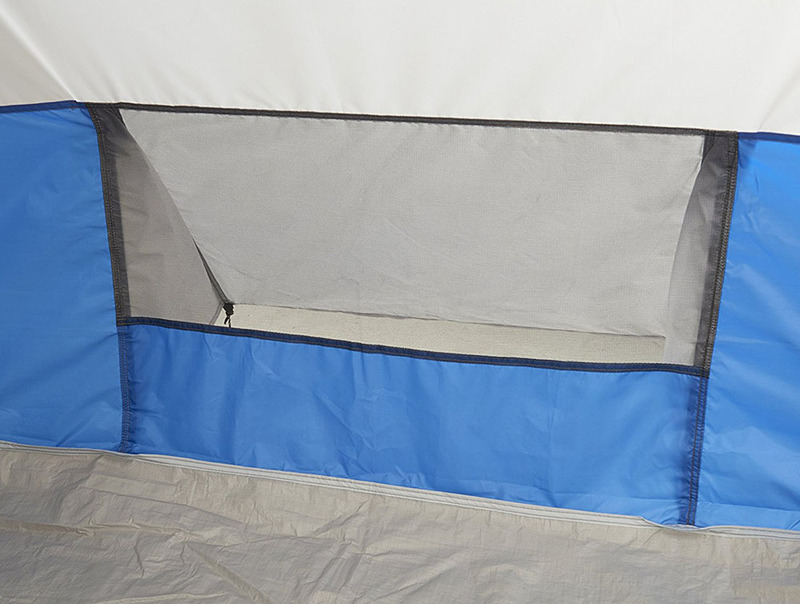 This is a great tent if you are looking for lots of space but don’t like spreading out as much. 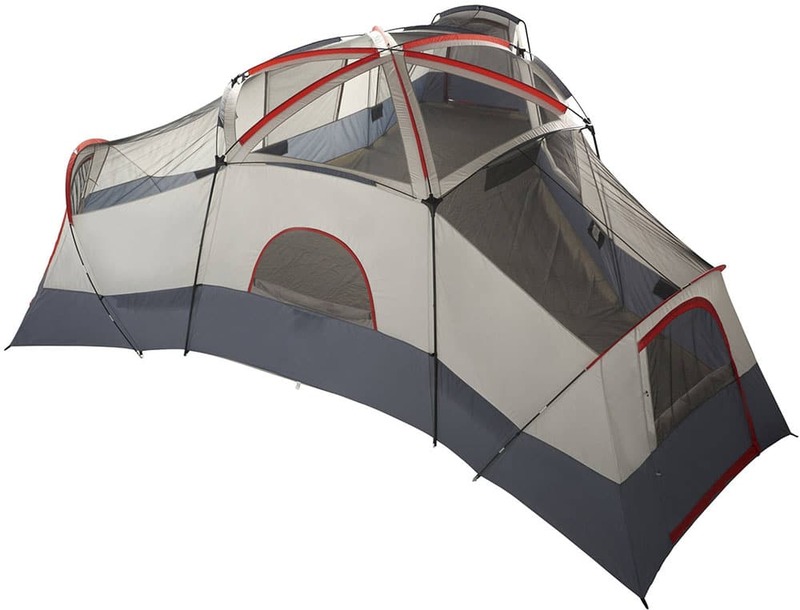 This tent will keep everyone in one big open space, which is great when the group is a little more social. 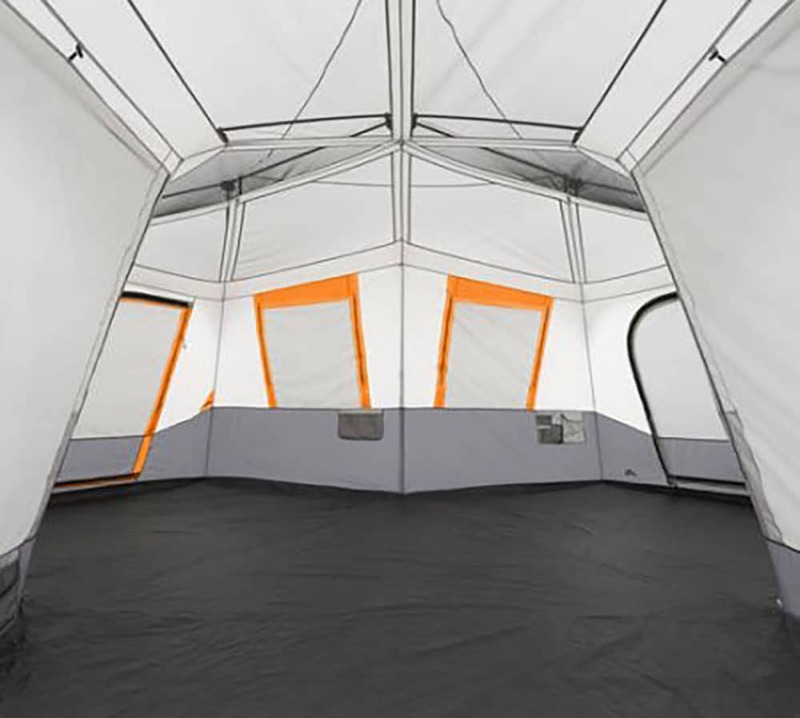 This tent also has 8 windows as well as top and bottom vents, allowing for great ventilation options in all weather conditions. 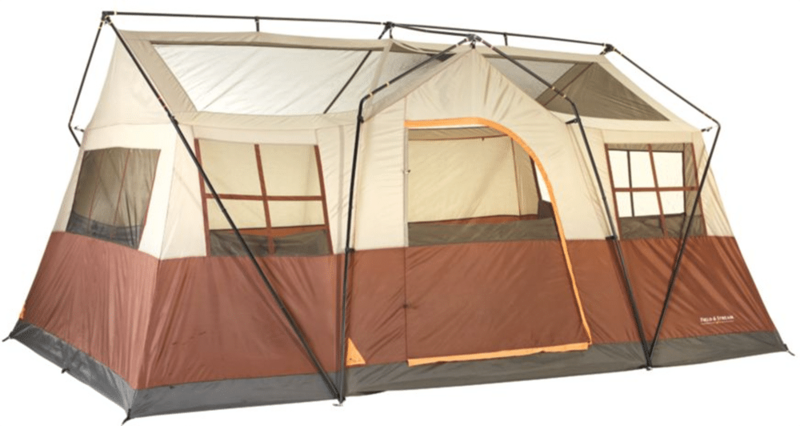 Field & Stream’s Highlands Lodge tent can sleep up to 12 people and was designed to feel like an actual cabin. 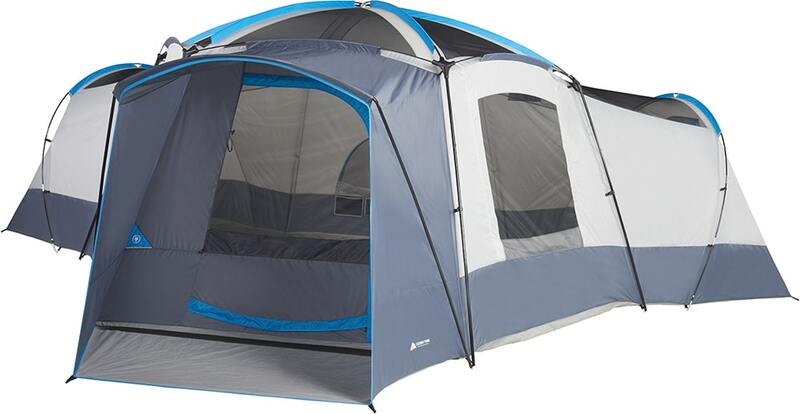 With 176 sqft of floor space, this is a great sized tent for moderate sized families and groups. Feild & Stream did go the extra mile and taped all major seams on the rain fly to help keep out the rain. 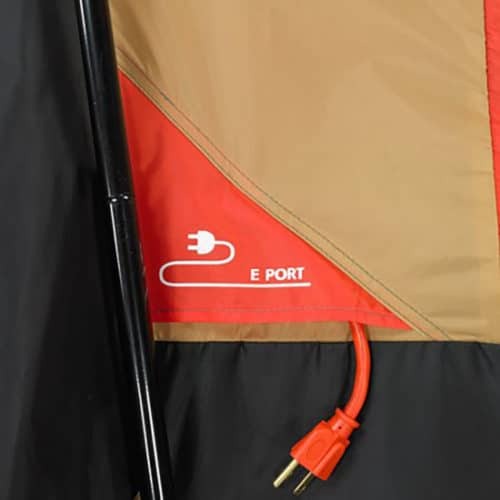 This tent is not an instant tent but is also not know for being difficult to set up. 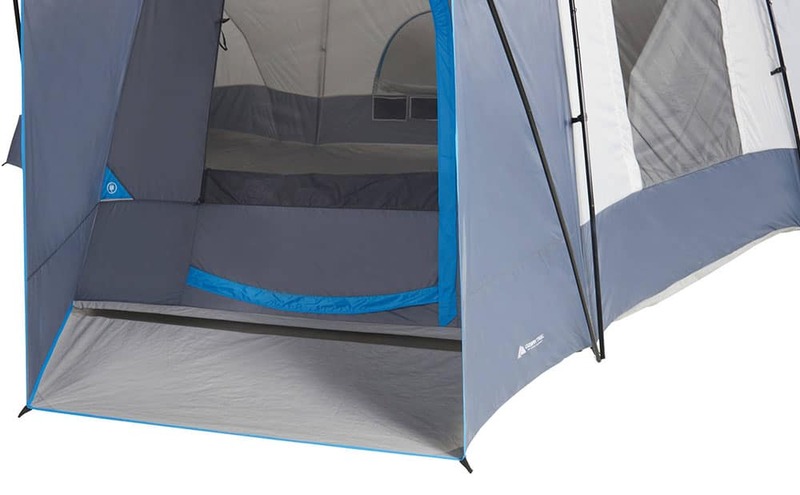 With 2 adults, this tent can be set up quickly without much difficulty. 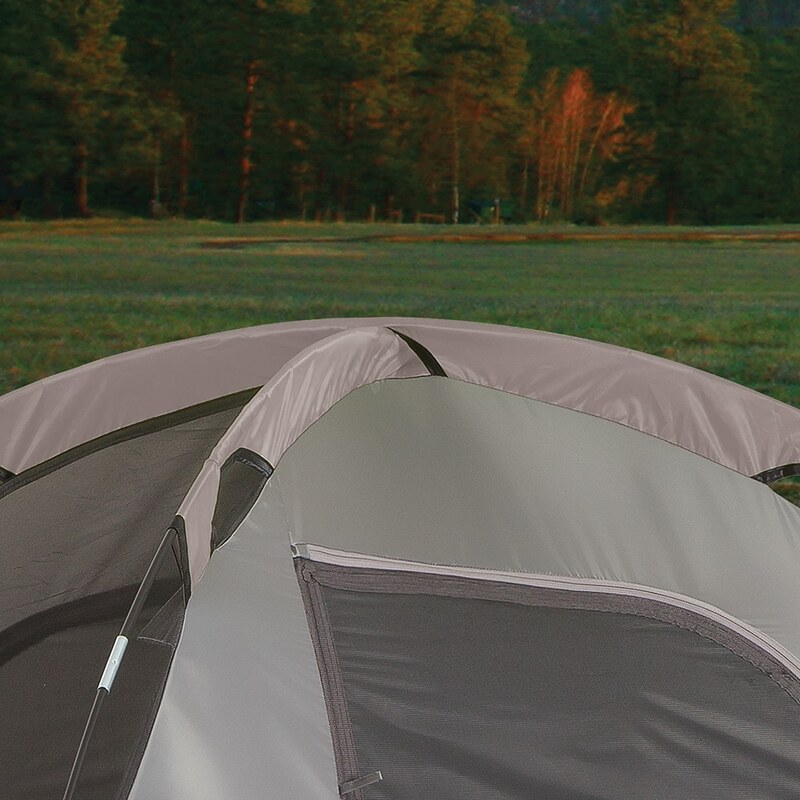 Ozark Trails has been producing more tents that have a Y shape. 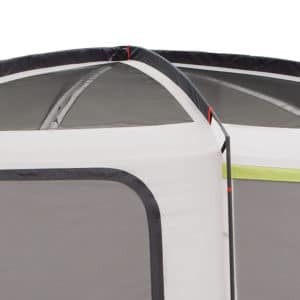 It allows them to get more space in the tent without having to go wider. 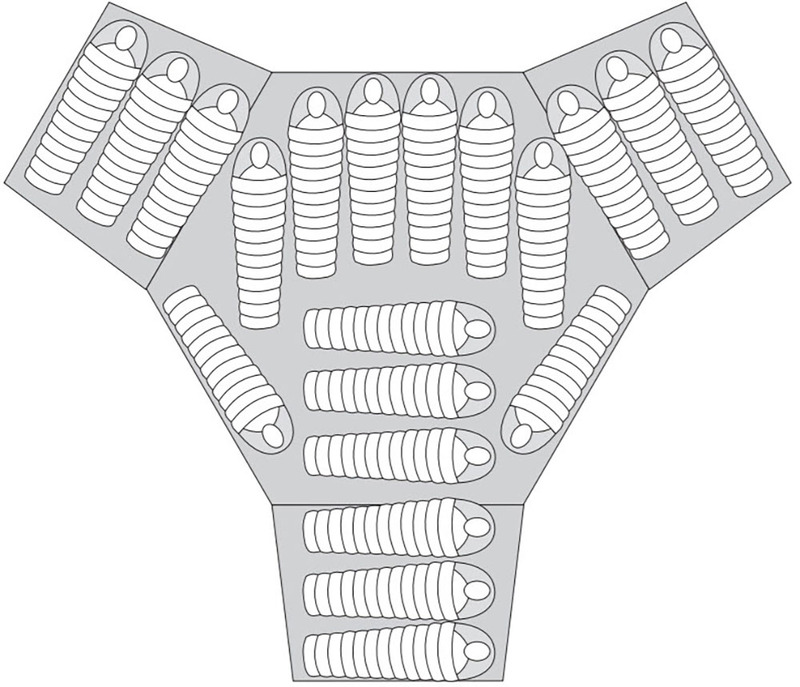 This large family tent is one of those Y shaped tents. 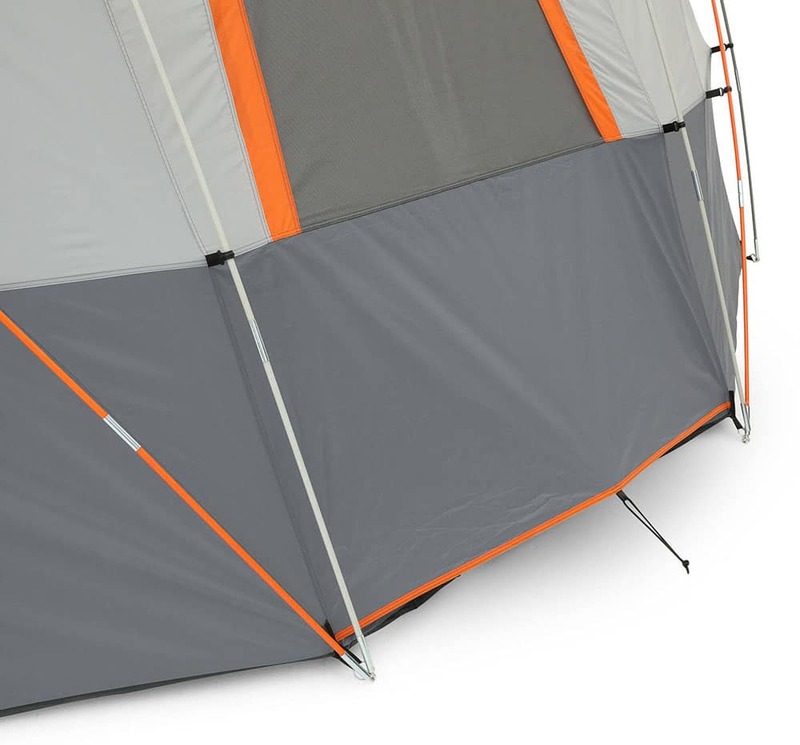 It measures 20′ x 18′ but is not square. 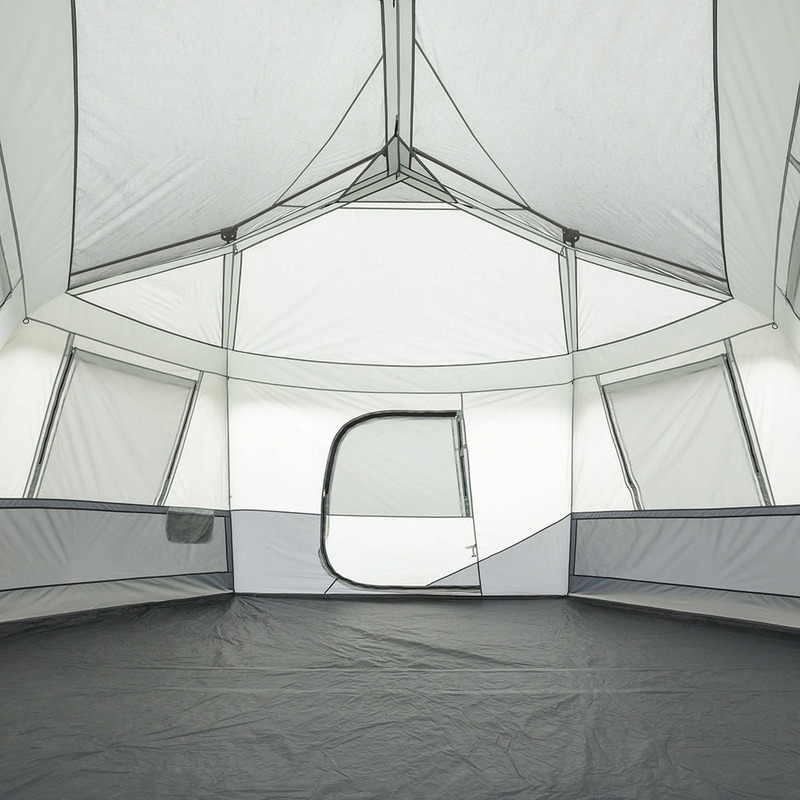 This tent offers 3 separate sections which make it easy to create private areas with room dividers. 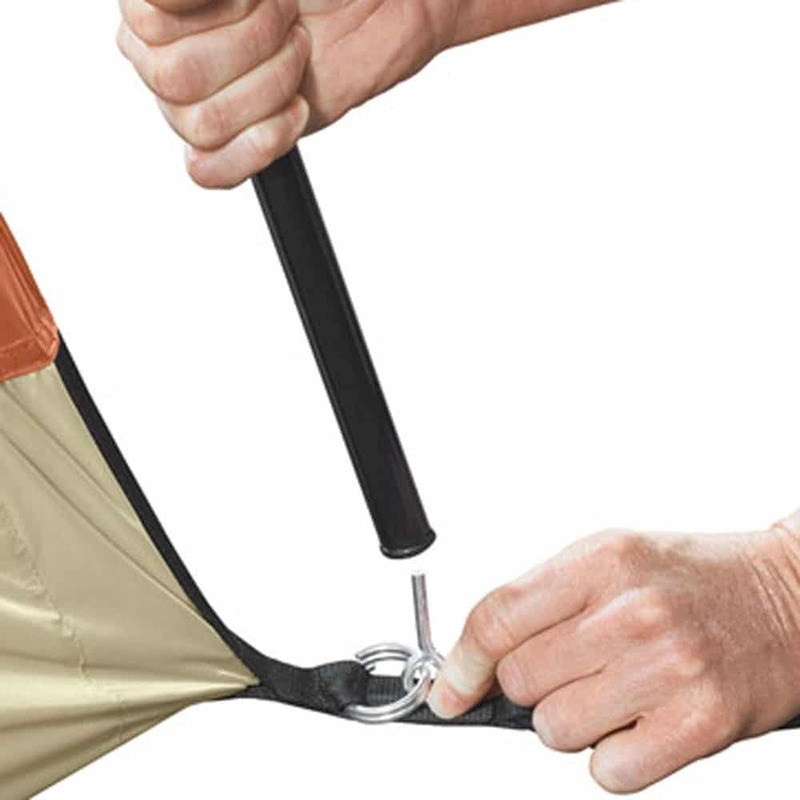 This is an instant tent making set up and take down fast an easy. 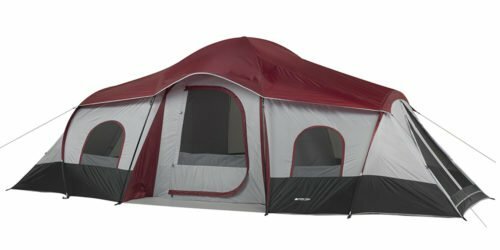 This is a great tent for people looking for 3 separate rooms who are limited by the overall length they have to set up their tent. 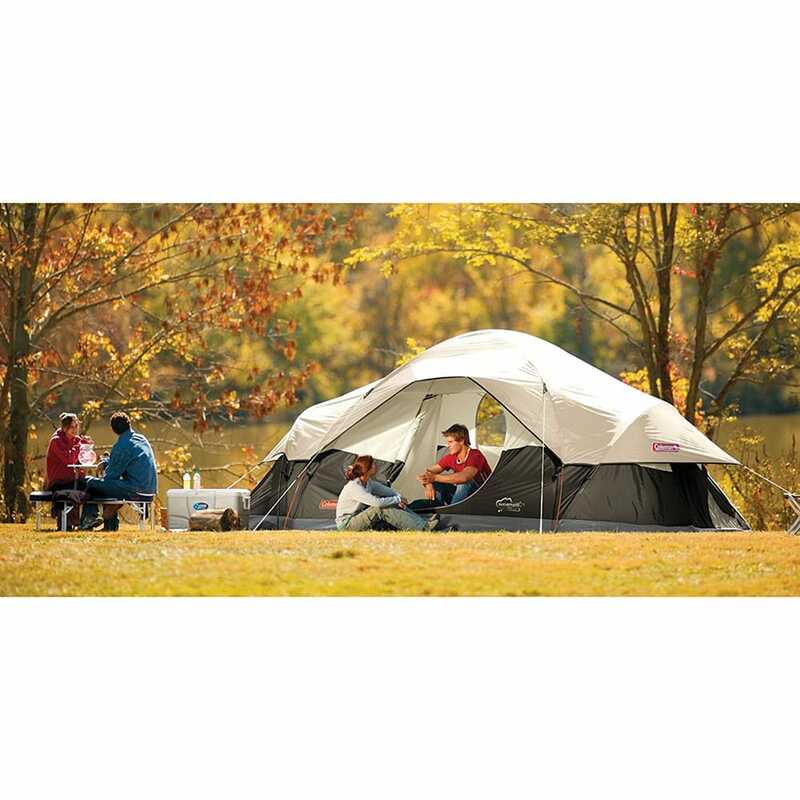 Coleman’s Prairie Breeze 9 person tent is a great solid tent for larger groups. 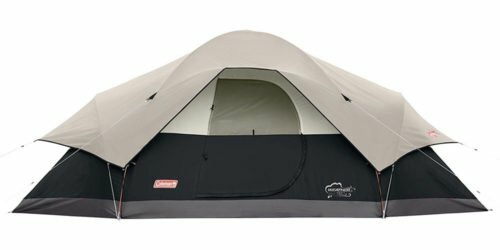 Coleman makes quality tents that have very few problems. 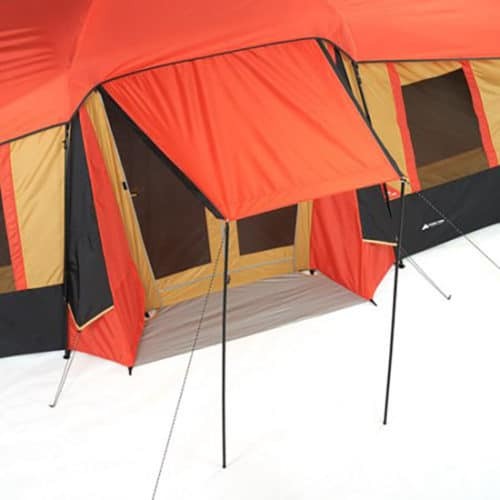 Their tents typically have extra features built in and are normally build to handle adverse weather conditions. 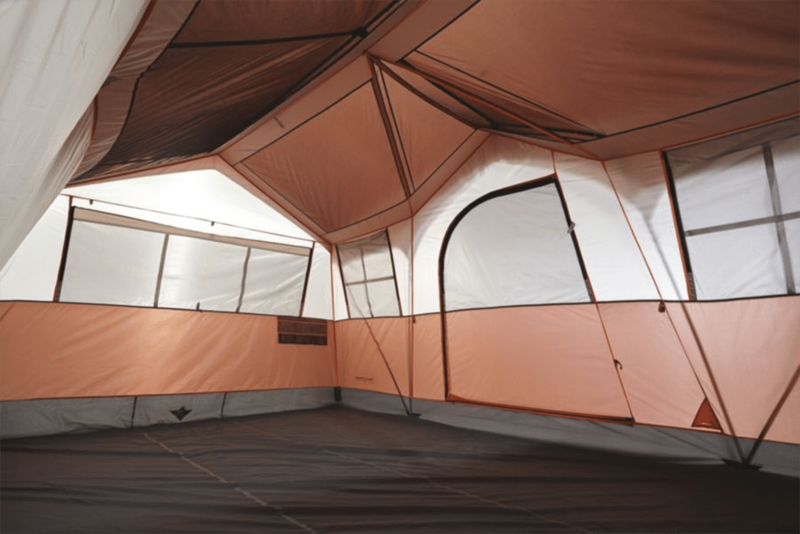 This is a great tent that maximizes its space with nearly vertical walls. 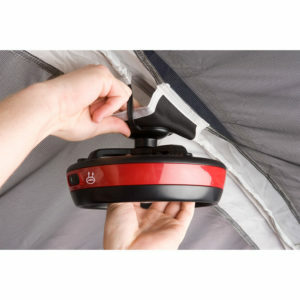 It also comes with an LED light fan that attaches to the top ceiling of the tent. 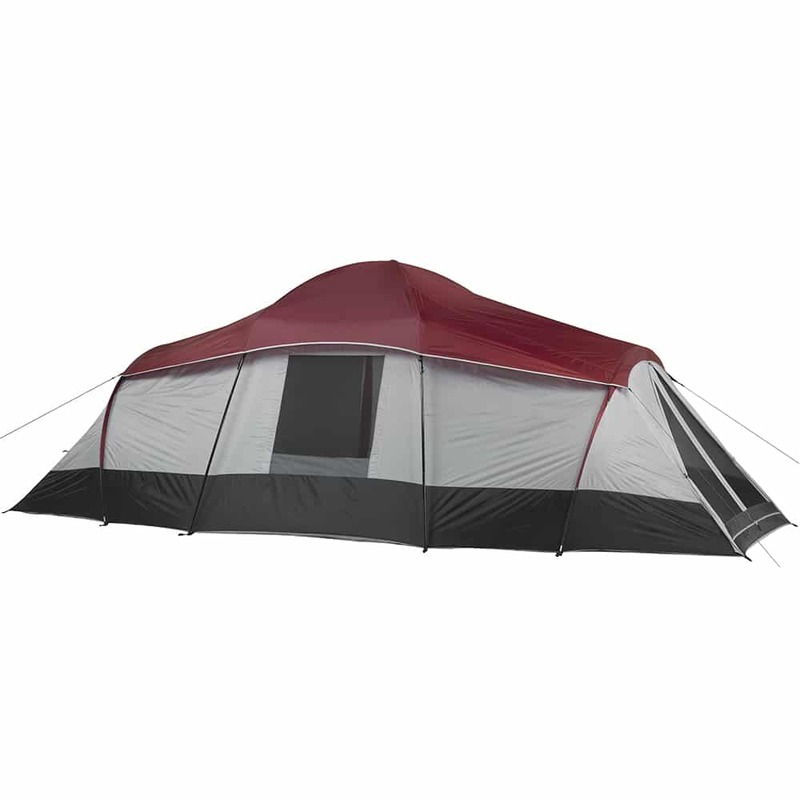 This is a great reliable tent for a moderate sized family or group of friends. 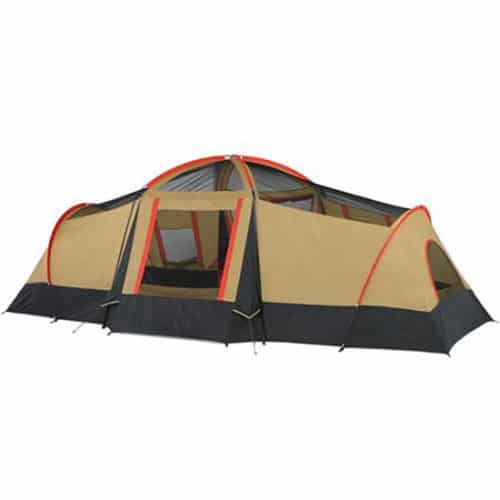 If you want a simple yet very reliable tent for your family this is the tent for you. 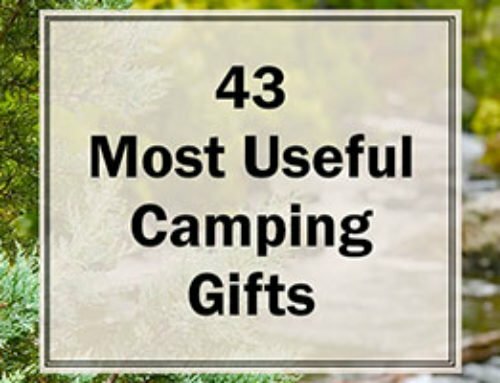 While it is not the biggest tent on the list, it still has lots of space for kids and friends. 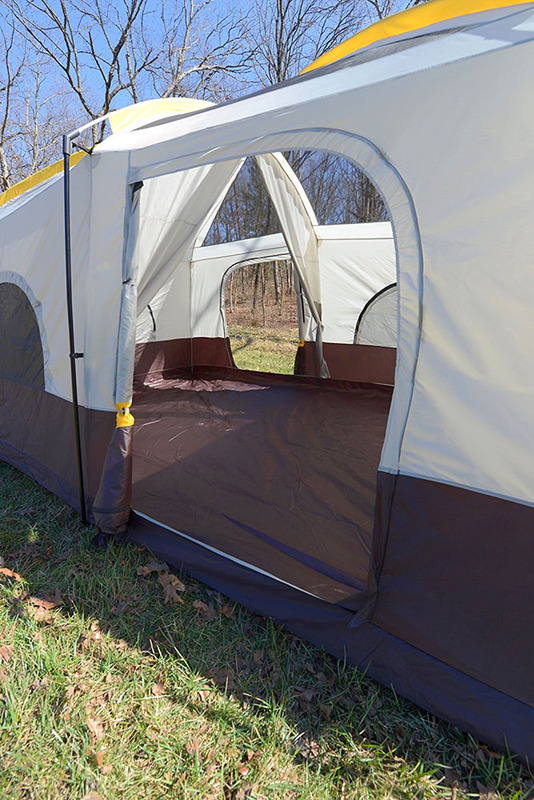 Ozark Trail’s 10 person 3 room tent is a great option for families. It provides lots of space without being too big. 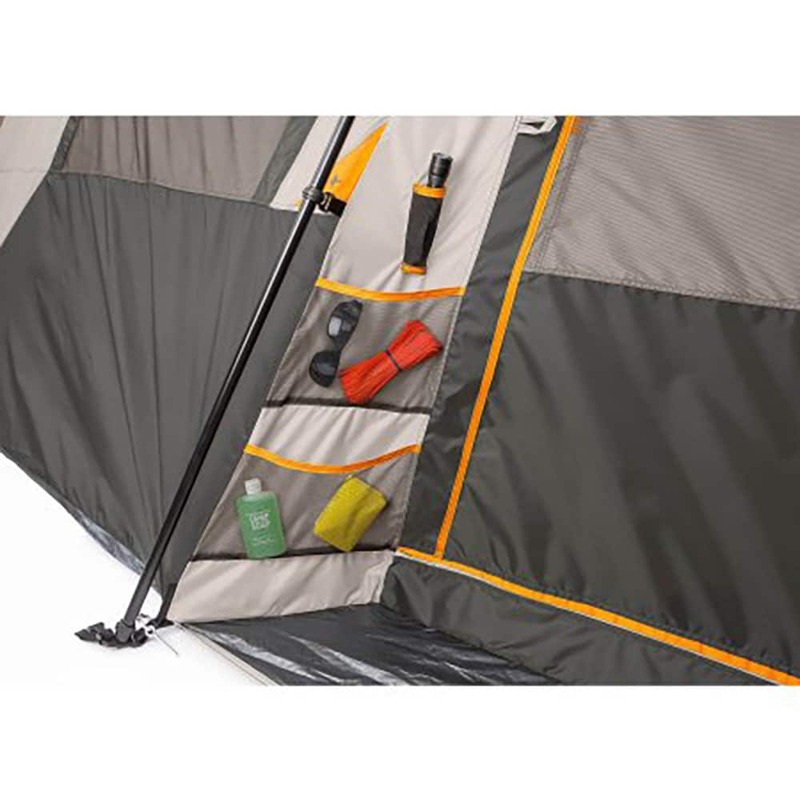 This tent is easy to set up and offers lots of great features. 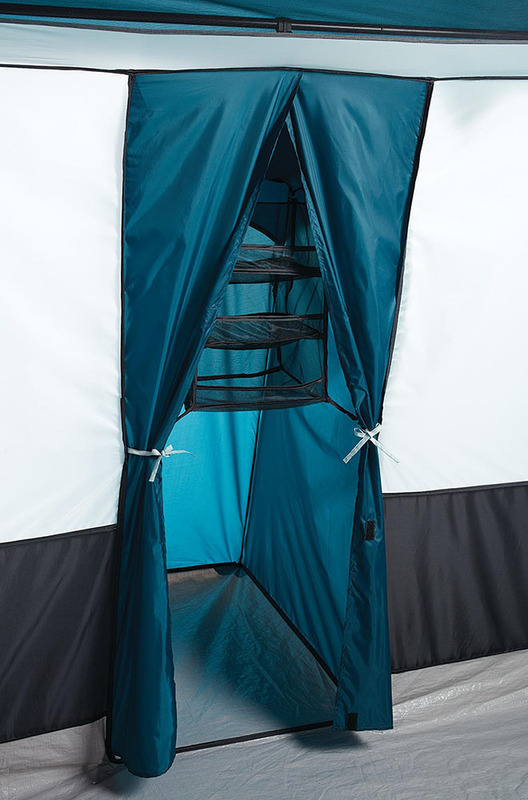 The entrance has a convenient small zippered door to allow for easy access and storage of small items, shoes, or anything else you’d like. 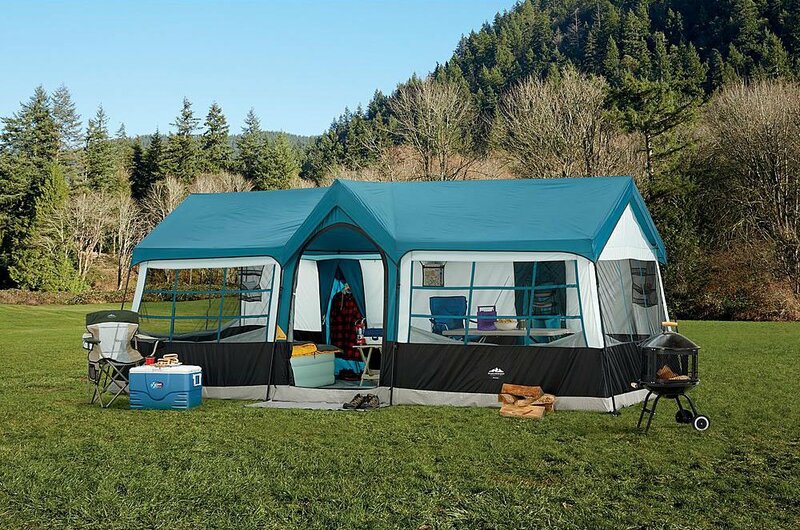 This family tent comes ready to handle wet conditions and even offers an awning to protect your entrance for getting wet and muddy. 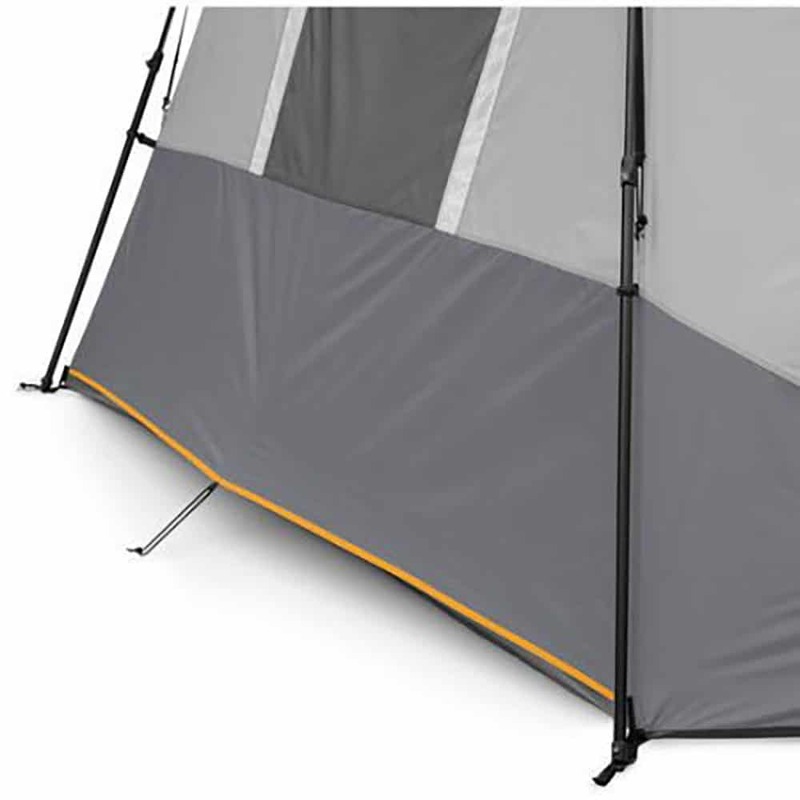 Ozark Trail provides 2 room dividers, allowing the tent to be divided into 3 separate live spaces. 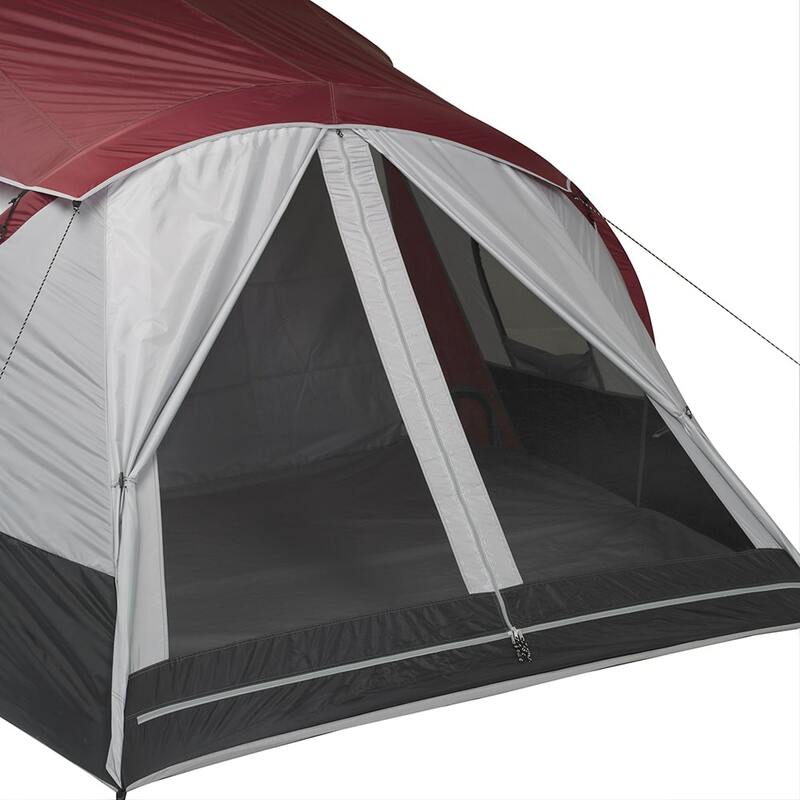 With floor dimensions of 20′ x 11′, this is a large camping tent that is a great option for many families of varying sizes. 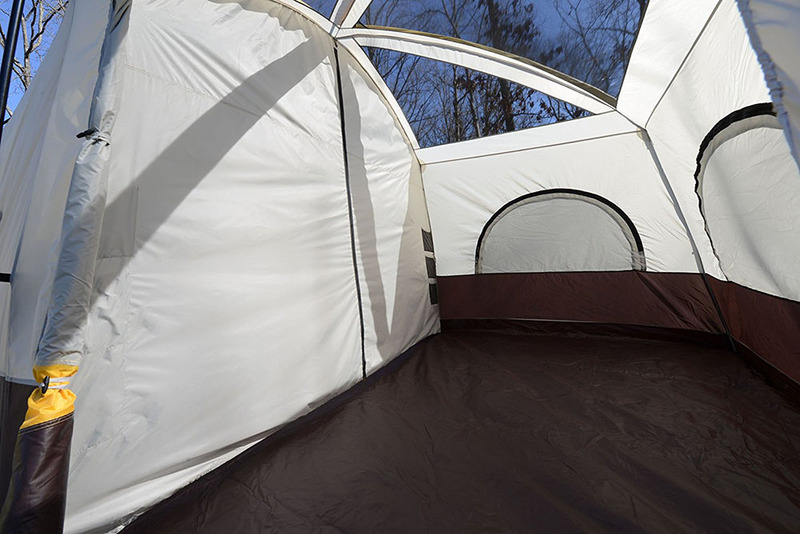 Ozark Trail’s 10 person 3 room cabin tent is one of their standard style tents. 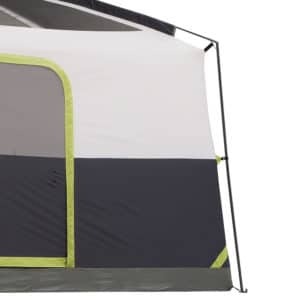 What makes this tent stand out is that it has 3 entrances. 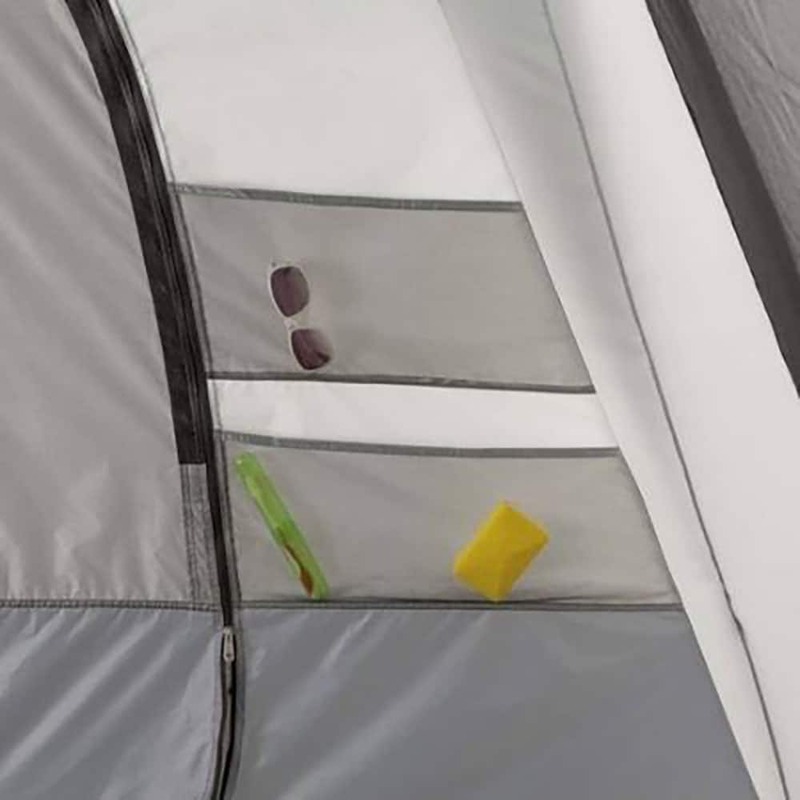 One in the front and one both sides of the tent. 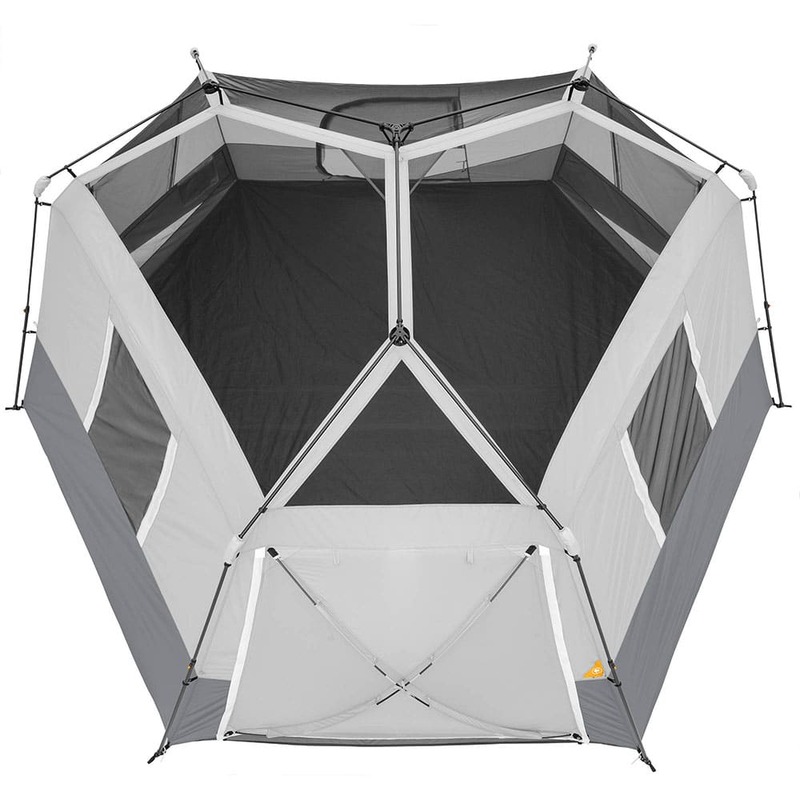 This tent can be divided into 3 separate rooms with their own entrance. This provides each room with more privacy and makes it easier to keep the living sections more independent of each other. 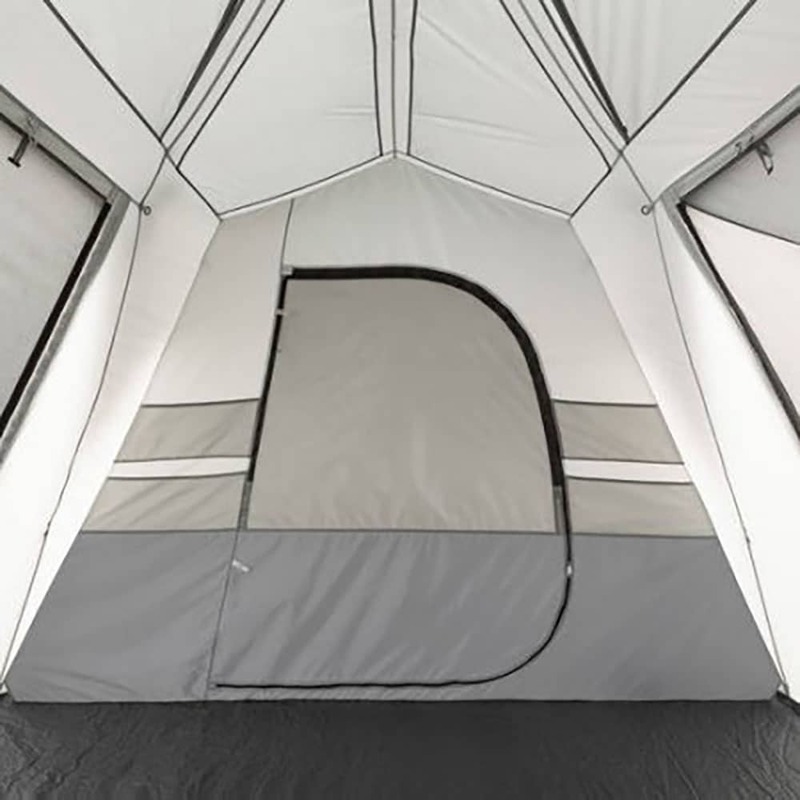 With floor dimensions of 20′ x 10′, this is not the largest tent available but it does offer lots of space with added privacy. 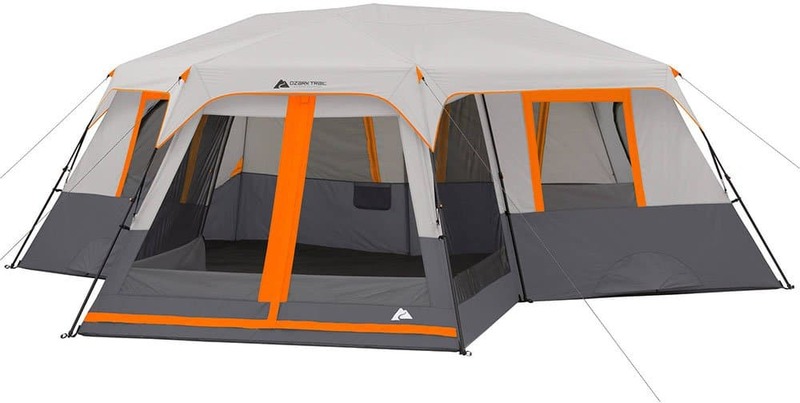 If you are looking for a tent that has a separate entrance for each room and don’t need a super large tent, then this is the tent for you. 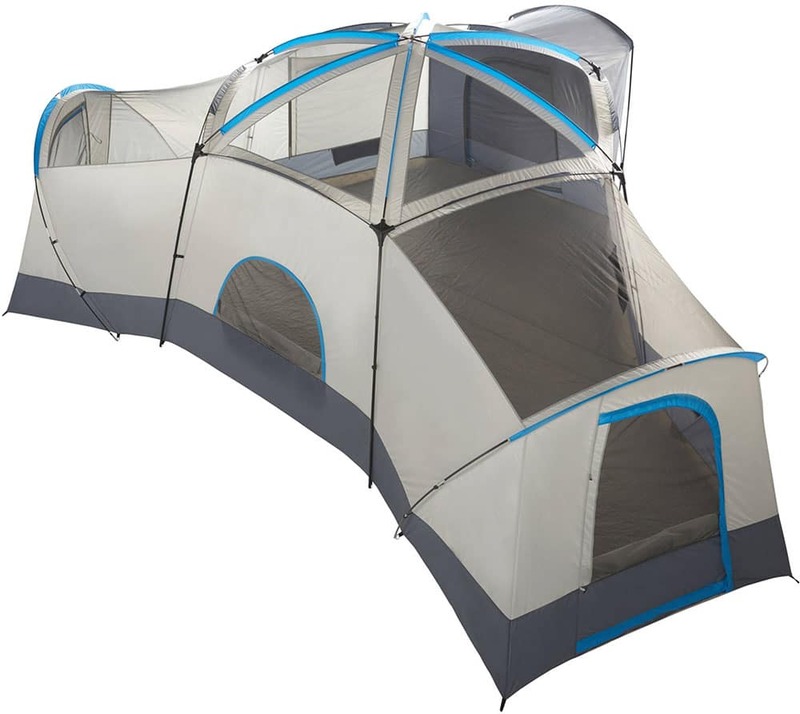 This is an awesome tent with lots of space. 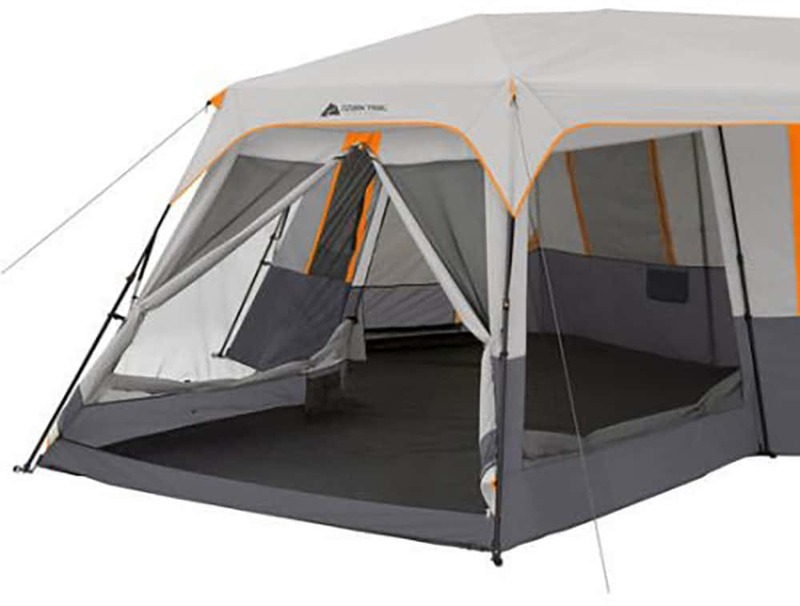 Ozark Trail’s Base Camp Tent offers 235 sqft of space and can be divided into 1, 2, 3, or separate rooms. 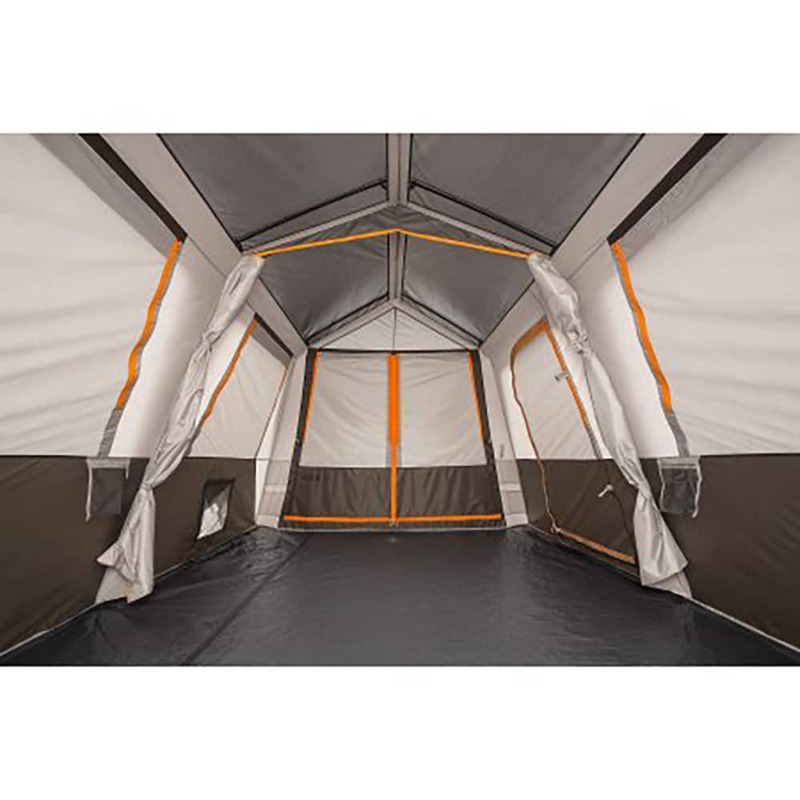 Another nice feature is that each side of the tent has it’s own entrance, meaning if it is divided into 4 rooms, each room has it’s own entrance. 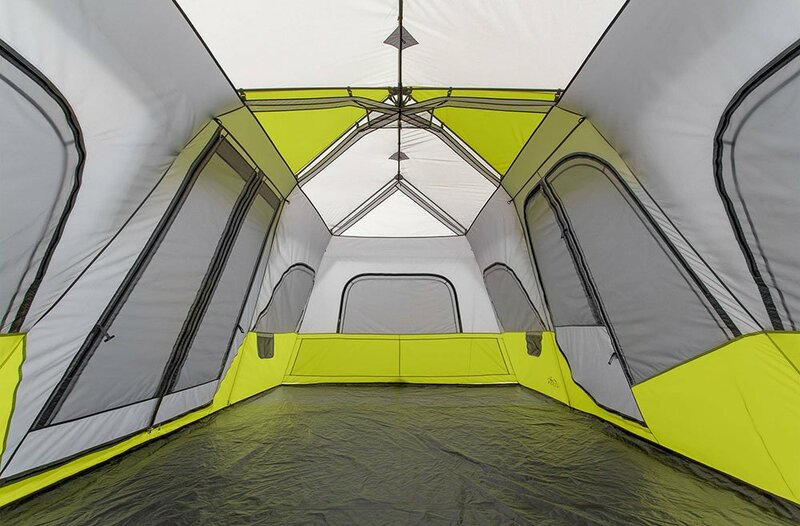 This tent has lots of windows and even a mesh ceiling, making for great ventilation. 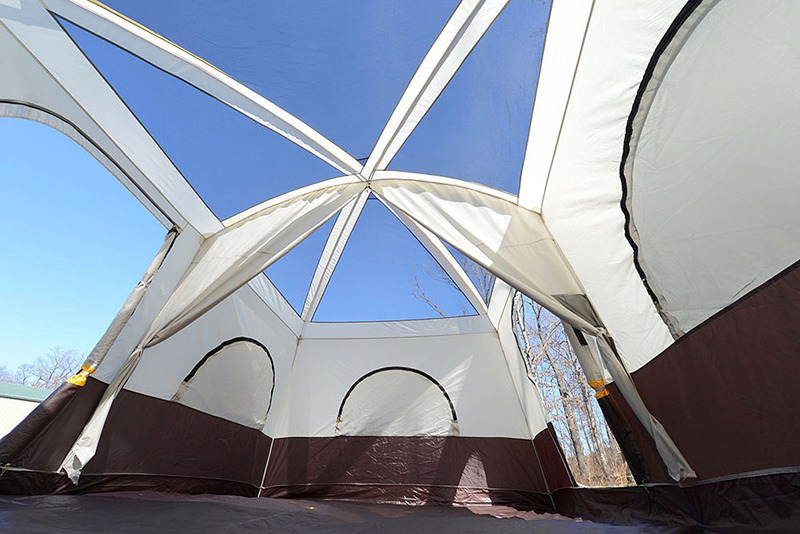 This is an awesome tent that offers families the ability to have many different rooms and living spaces. 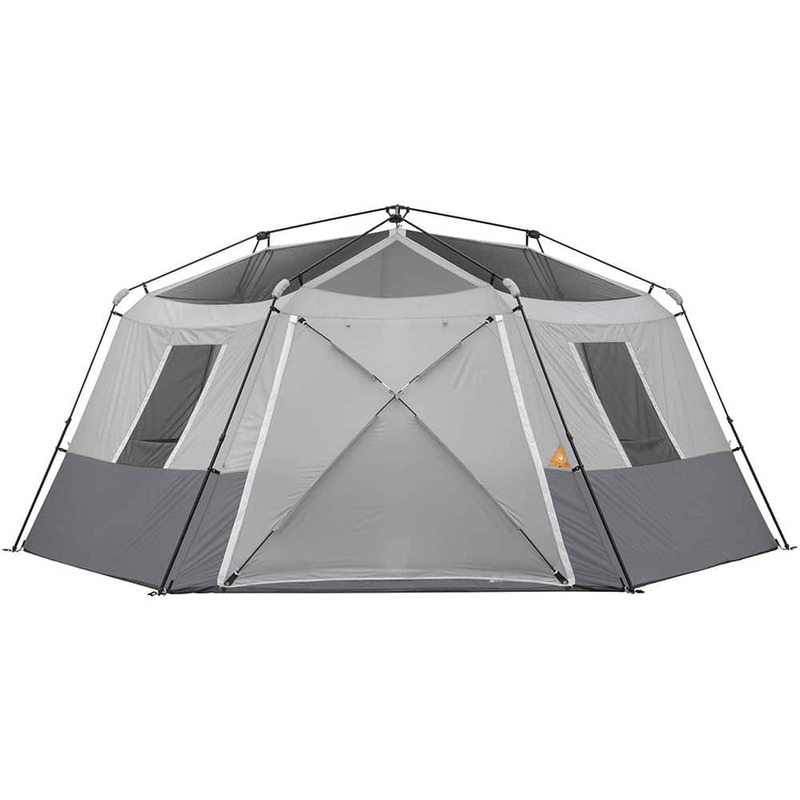 If you want a large family tent with many different rooms, this is the tent for you. 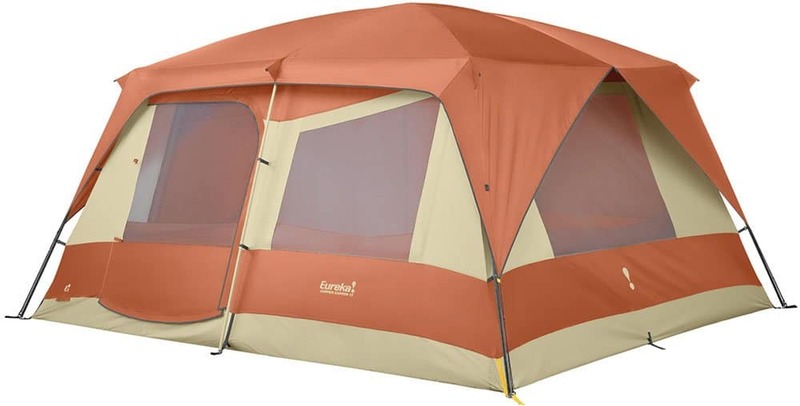 This Bushnell camping tent is a well-made tent ready for adverse weather conditions. 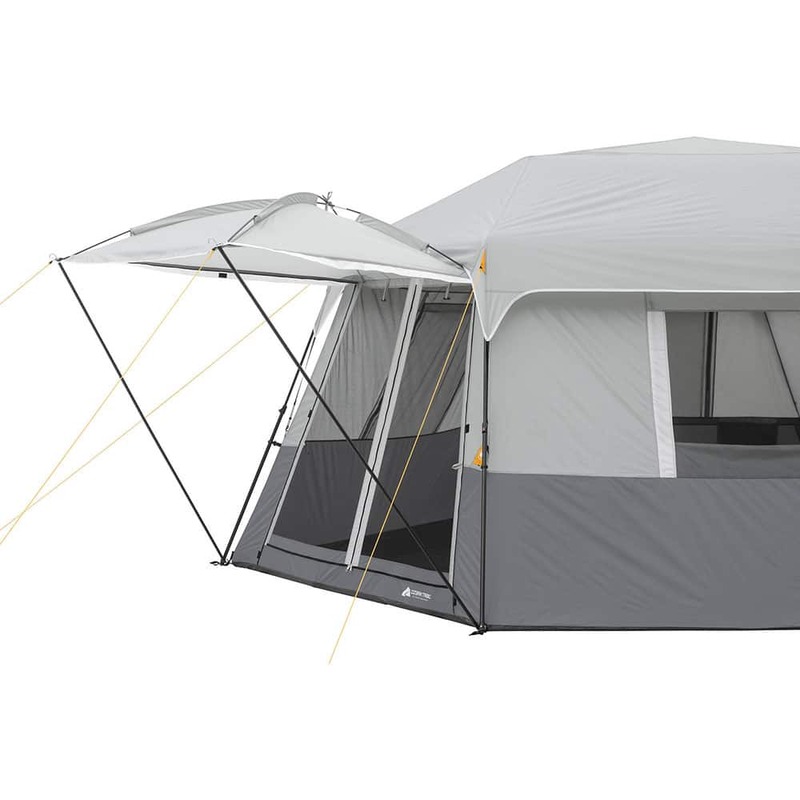 With floor dimensions of 15′ x 9′, this is not the biggest tent but it does offer lots of space for moderately sized families. 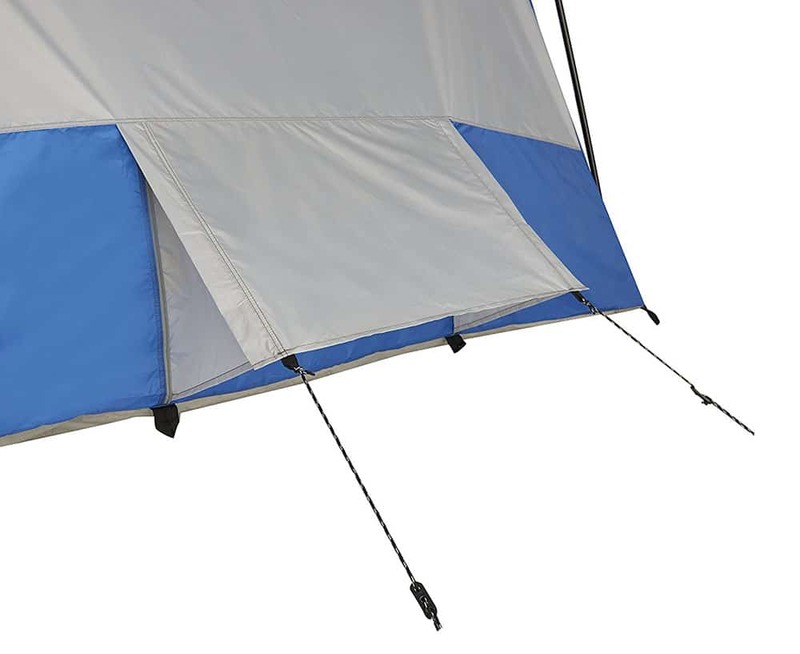 This tent comes with fully taped waterproof seams and a very sturdy frame, giving it the ability to handle even stronger storms. 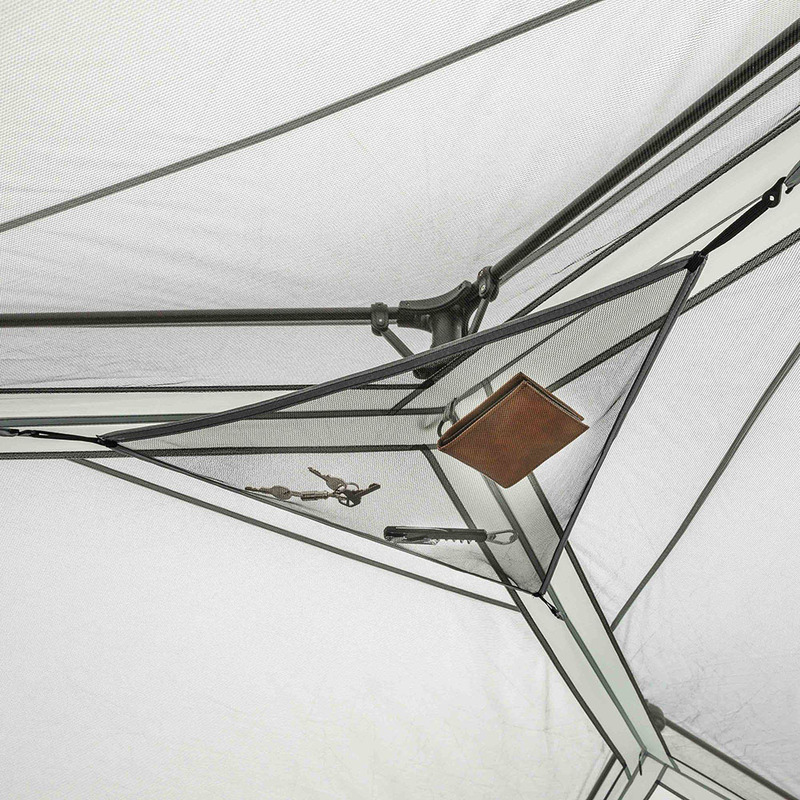 Another great feature of this tent is its heat shield technology. 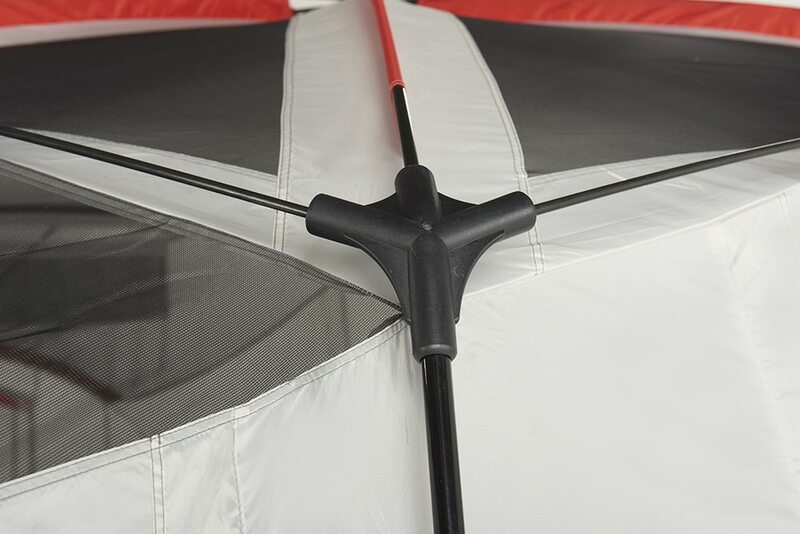 The underside of the rainfly has a special reflective coating that reflects UV rays. 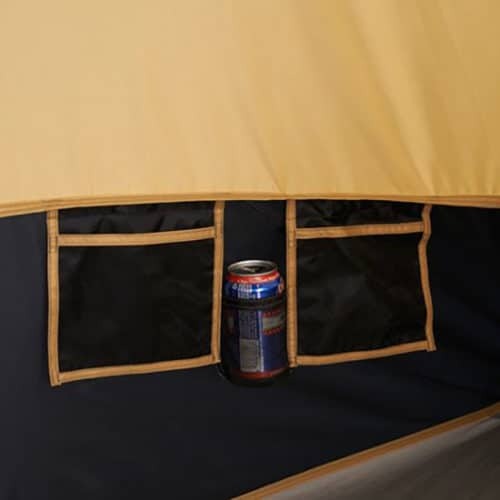 This helps the tent to remain cooler and even darker during the day. 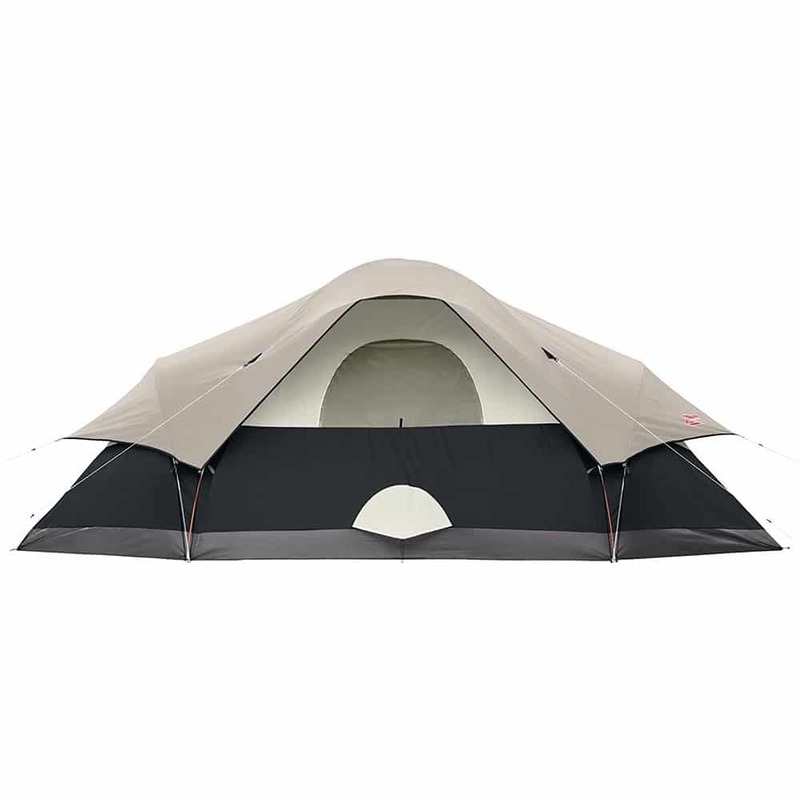 If you want a tent intended to handle bad weather conditions and still be big enough for your family, this Bushnell Shield Series tent is for you. 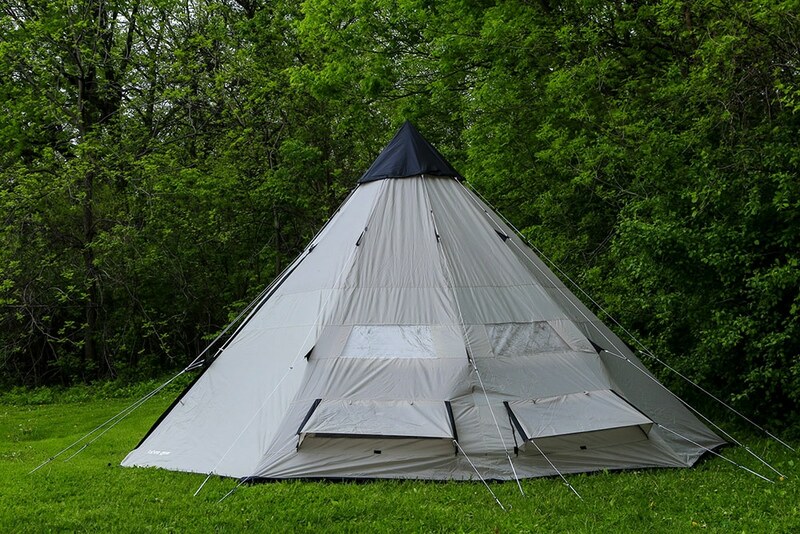 This is the only teepee tent on our list but it is big and can fit up to 12 people. 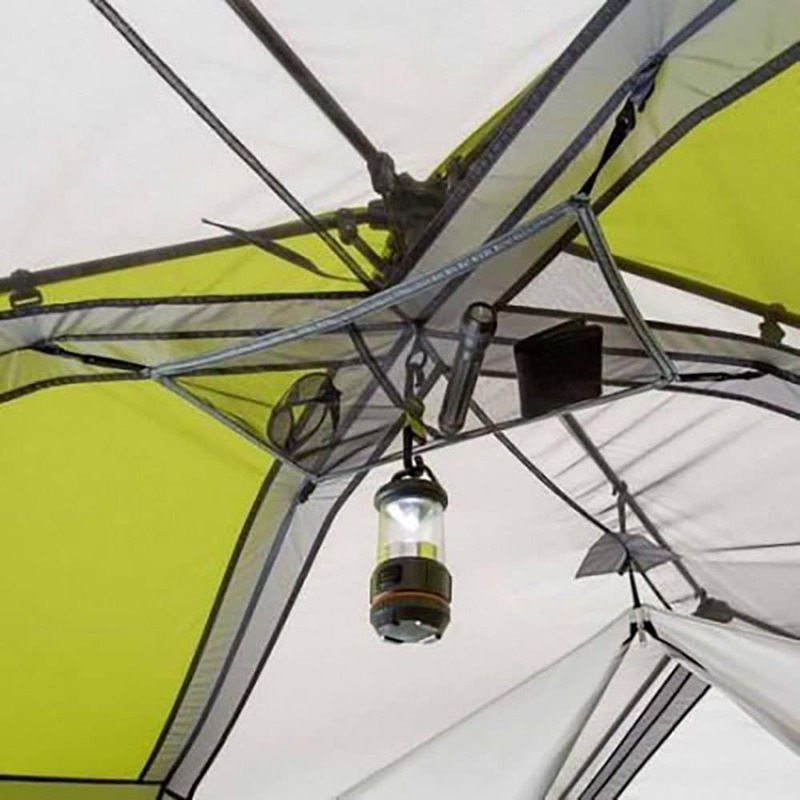 Taho Gear has done a great job at making a family-friendly tent that is very versatile and has some great features. 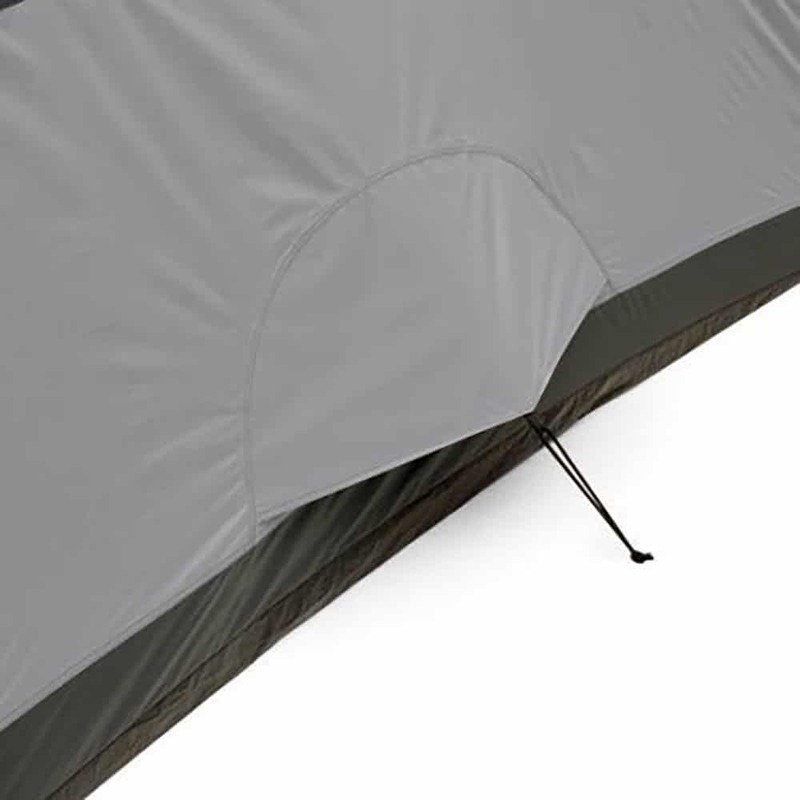 This tent is fully waterproof and with its cone-shaped design, it does well in rainy conditions. 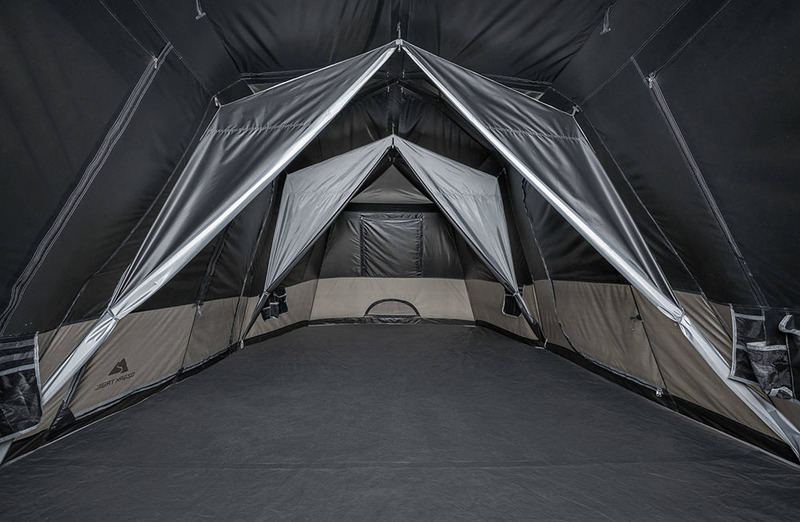 Another great feature of this tent is that the floor is completely removable. 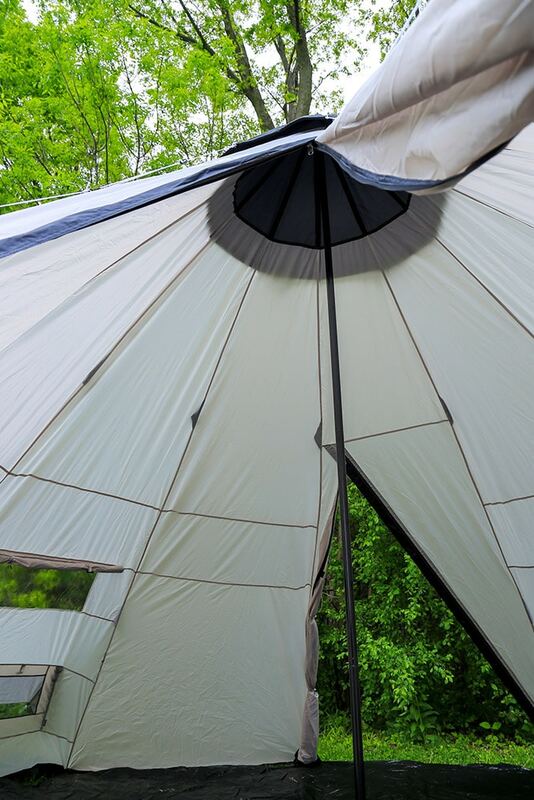 If you don’t need the floor you can easily remove it and only use the top of the tent. 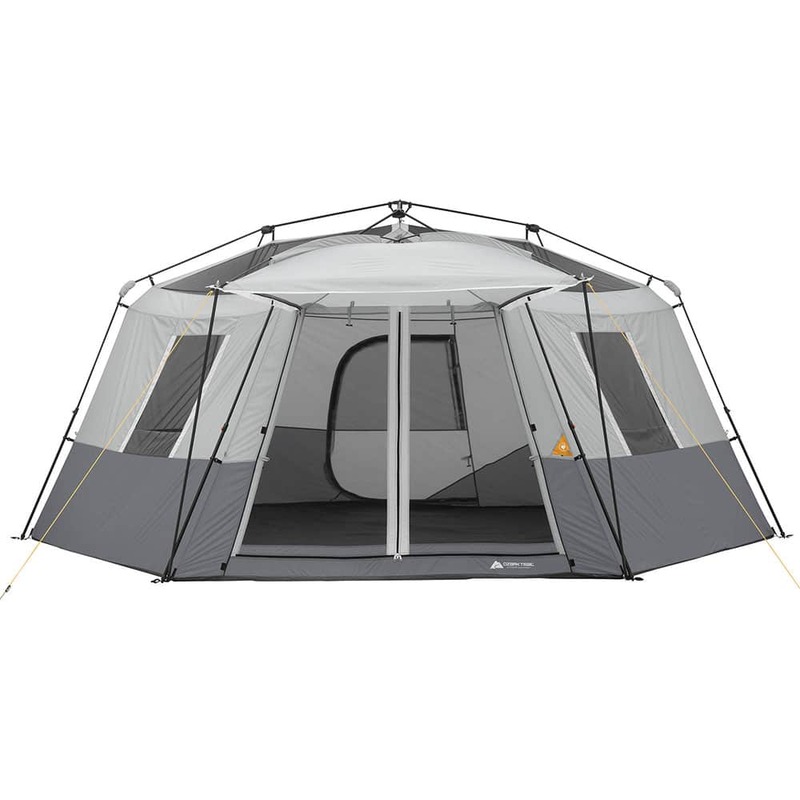 This is a great tent because it offers lots of space but with a circular floor, finding a spot to pitch the tent is easy. 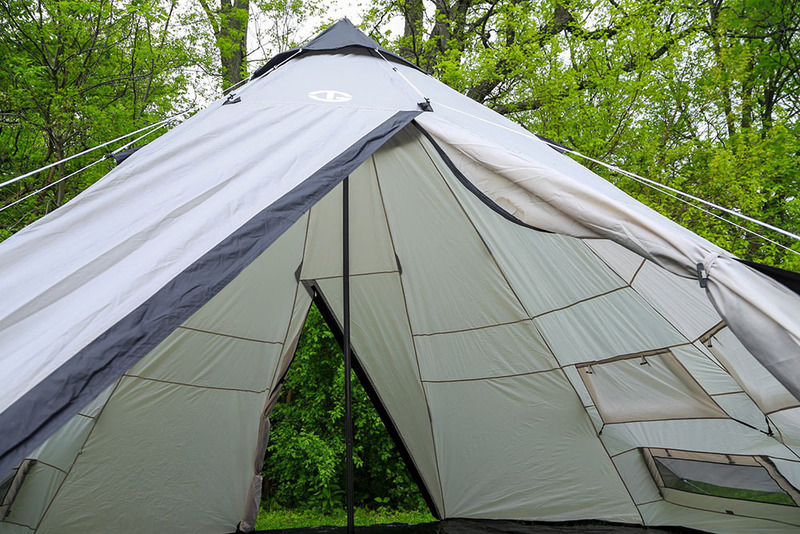 If you want to try out a teepee style tent with your entire family and might get some rain, this would be the tent for you. 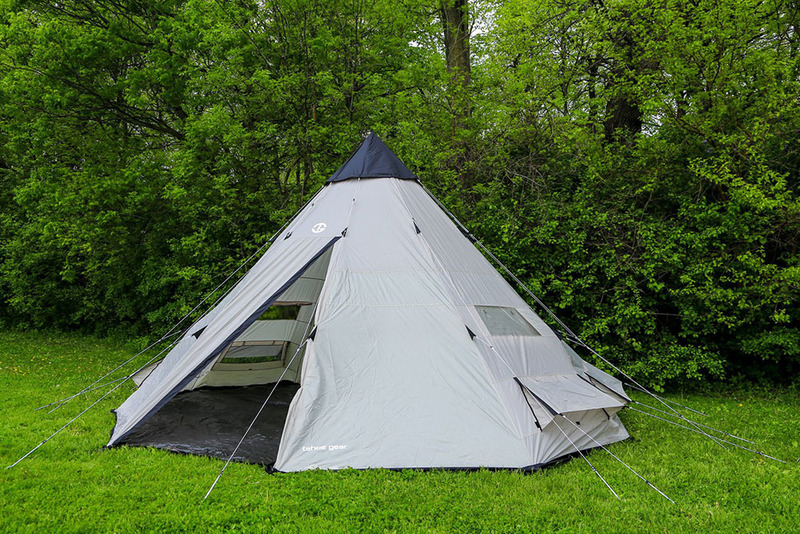 Wenzel’s Klonkide 8 person tent is the perfect a tent for families that don’t always need lots of space. 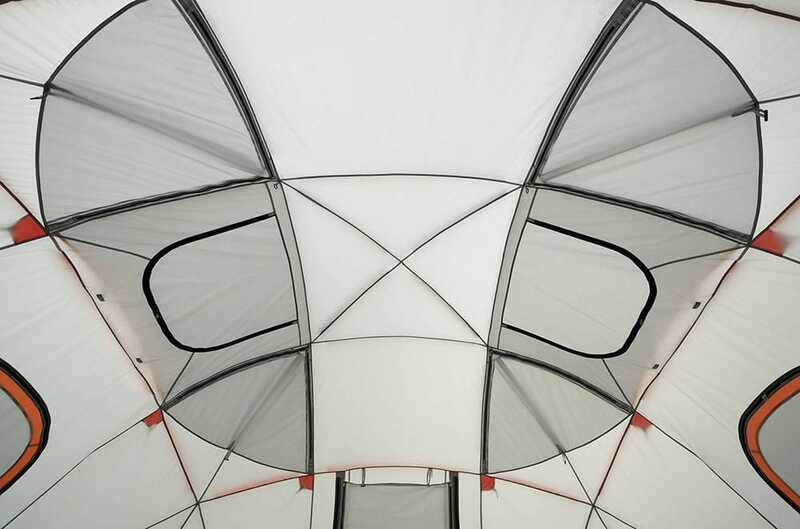 This tent has two distinct rooms. The room in the back is the primary sleeping area while the room in the front can either be a sleeping area or screened in porch. 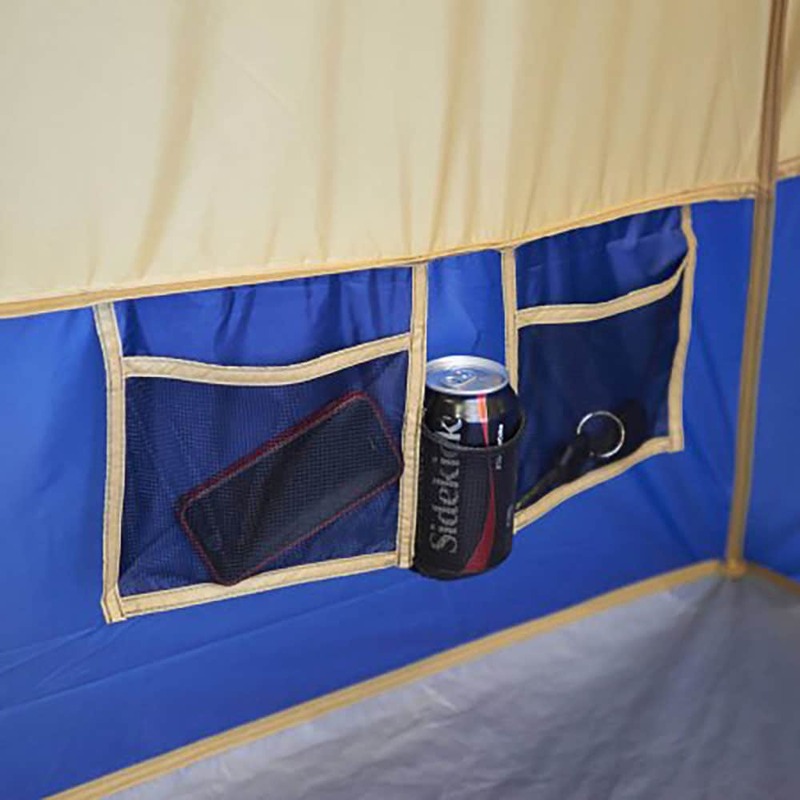 This makes the tent very versatile. 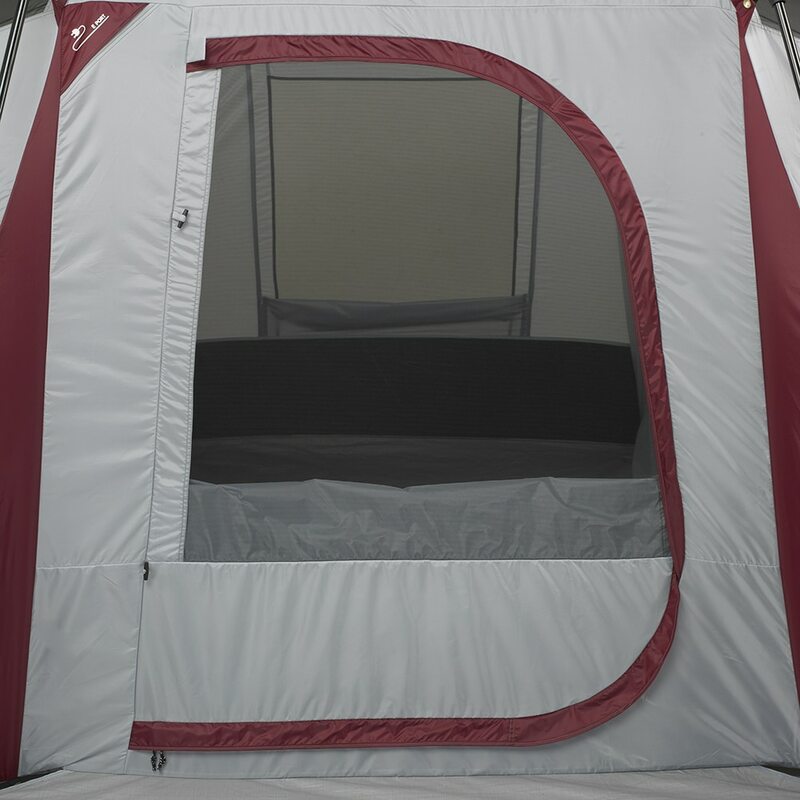 It is great for couples or small families but also has the ability to sleep up to 8 people when the need arises. 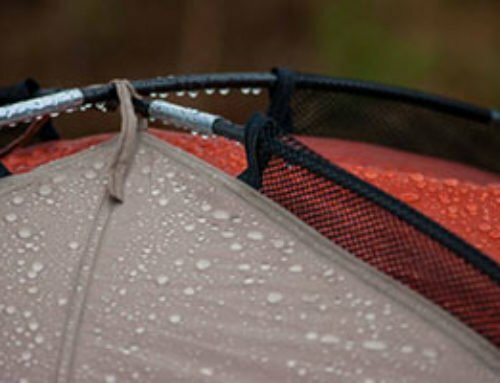 With a water-resistant rain fly and double-stitched, lap-felled seams, this tent also does well in rainy conditions. 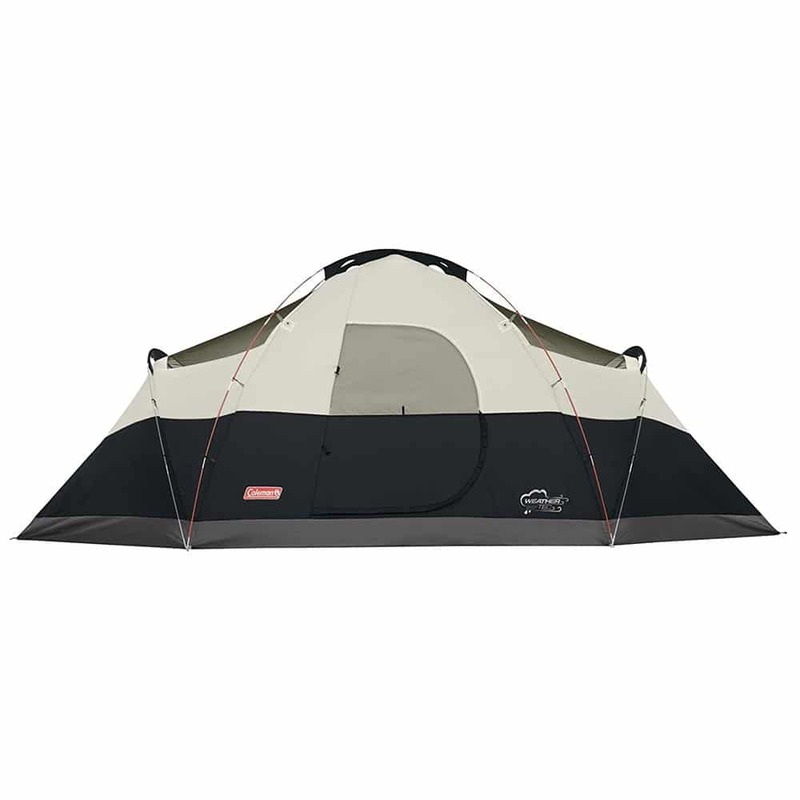 If you want a tent that works for small groups but can still handle larger groups, this is the tent for you. 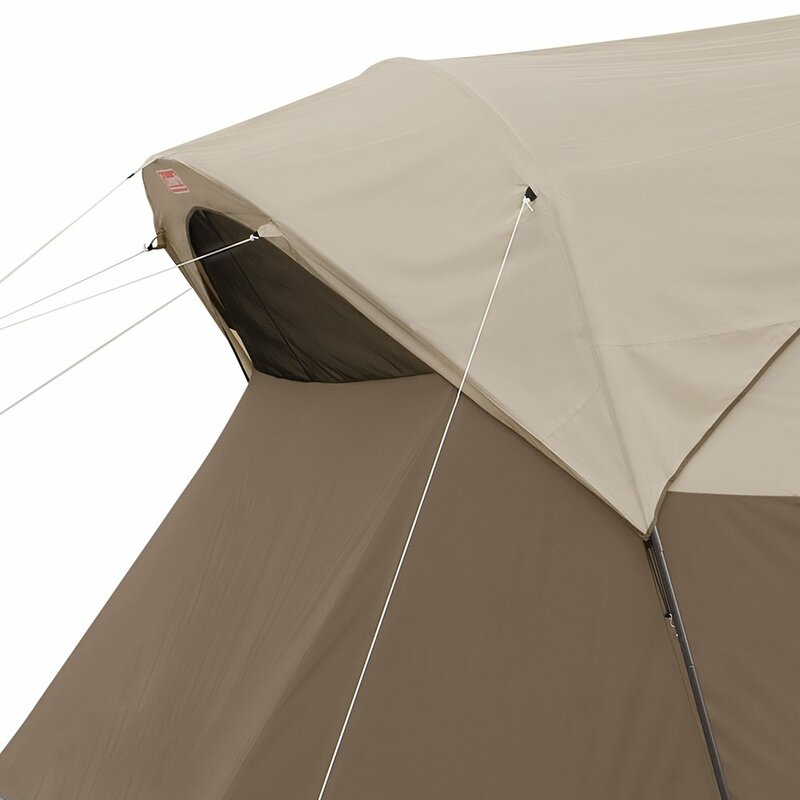 Browning’s Big Horn camping tent is a traditional well-made tent that offers lots of space for campers. 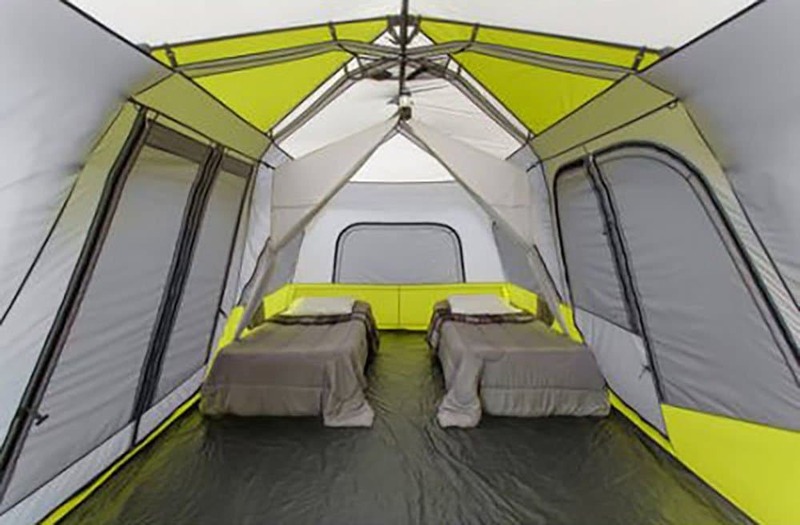 This tent has a floor space of 150 sqft allowing up to 8 people to sleep in the tent. 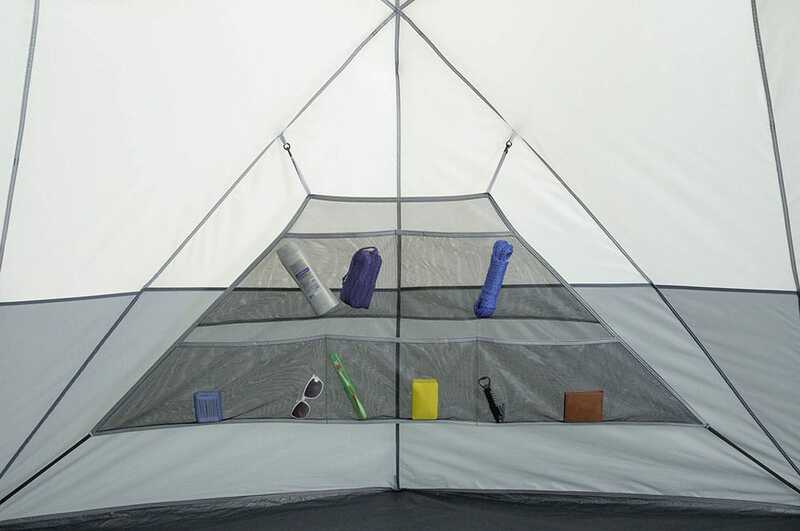 There a 2 entrances to the tent as well as a room divider. 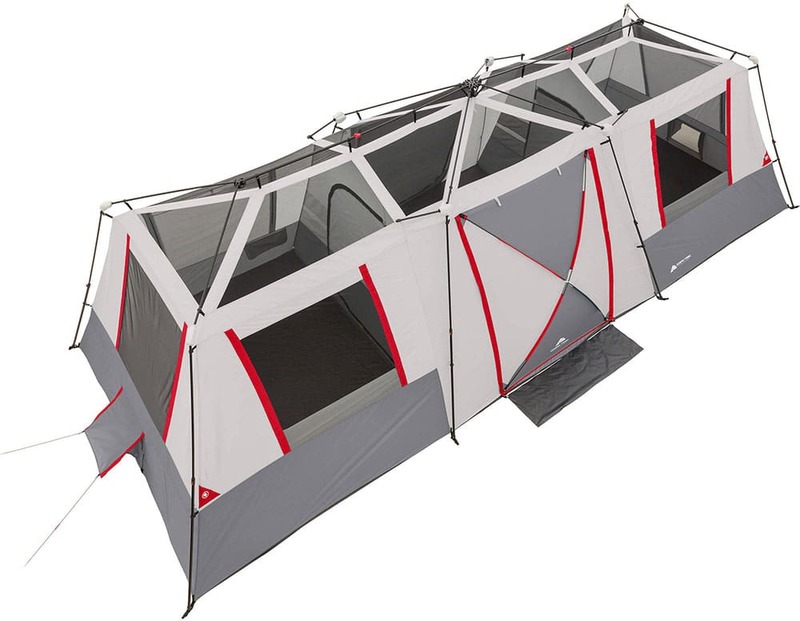 This allows the tent to be divided into 2 rooms with their own entrances. 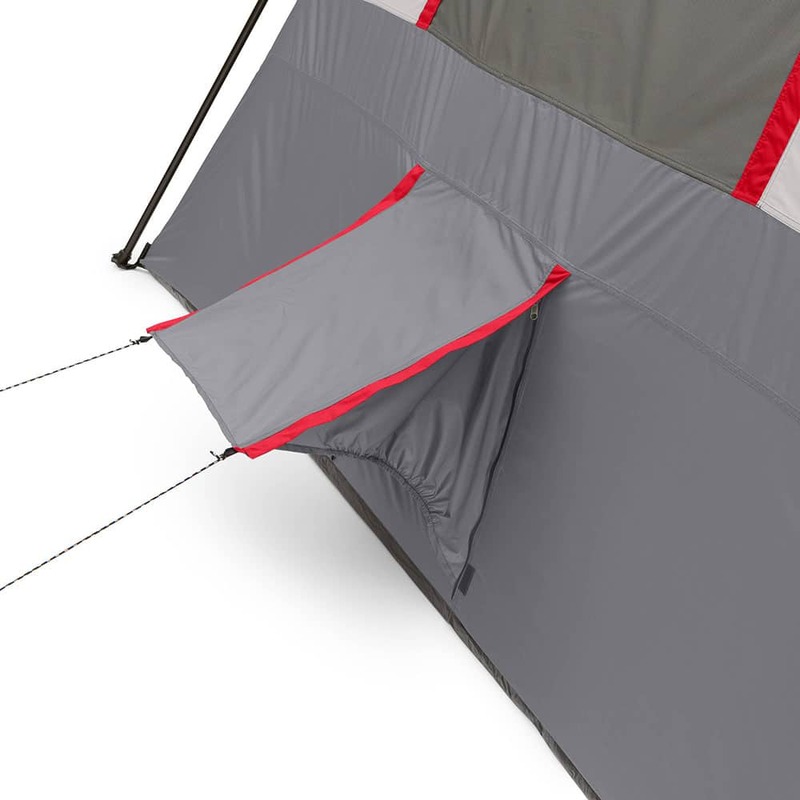 The Big Horn tent also comes with a rain fly that extends partially down the side walls of the tent. 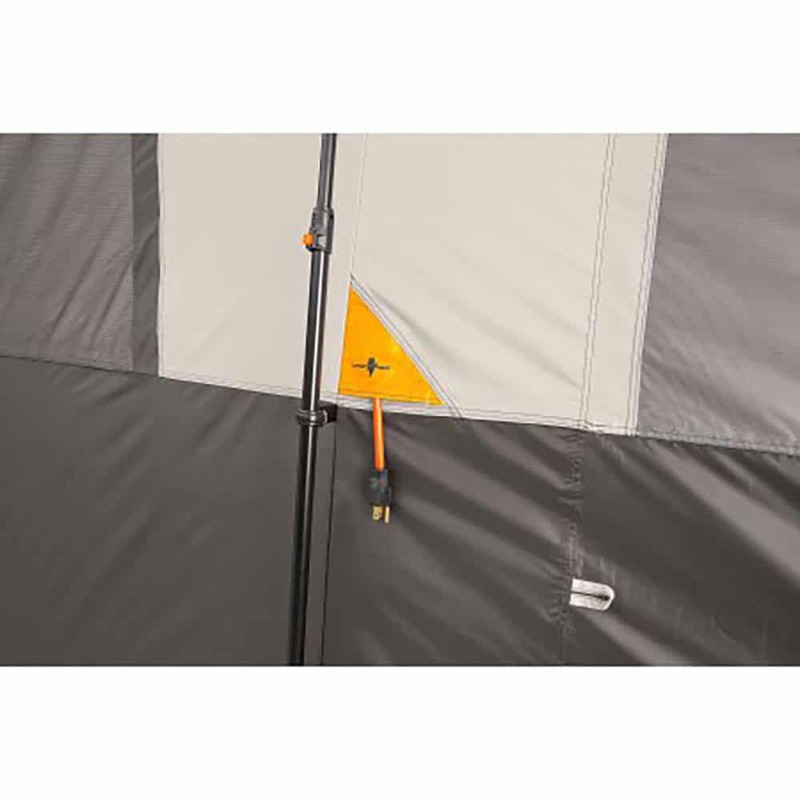 This provides the tent with superior rain protection. 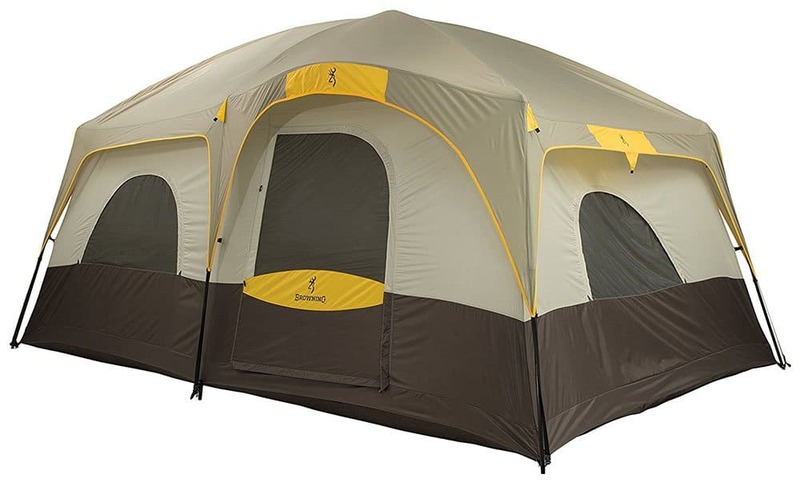 Bowning’s Big Horn tent is a great tent for families that provides lots of space with a sturdy design. 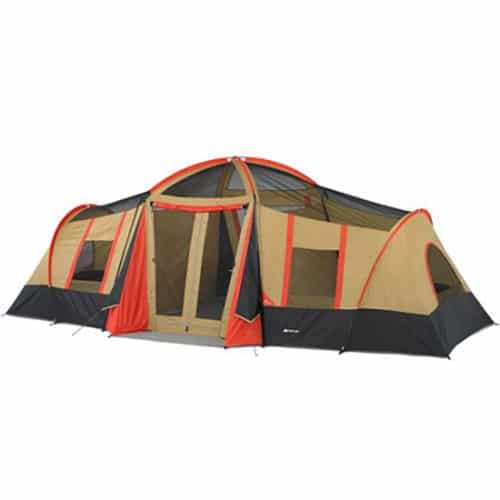 If you want a large camping then with multiple entrances and great weather protection, this is the tent for you. 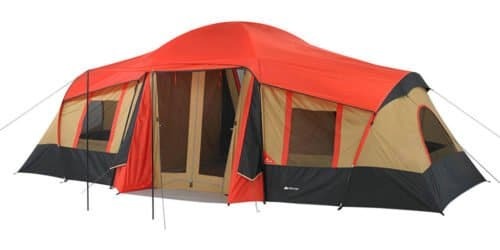 Coleman’s Red Canyon 8 person tent is a great tent that offers lots of space as well as tried and tested weather protection features. 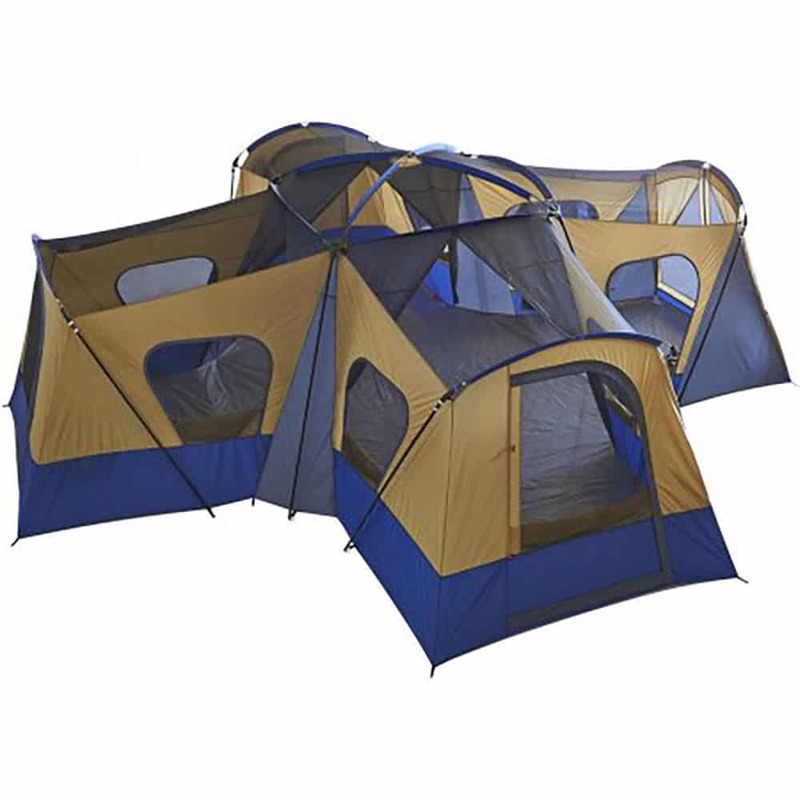 Coleman has been making tents for a long time and they have become very good at offering sturdy reliable tents. 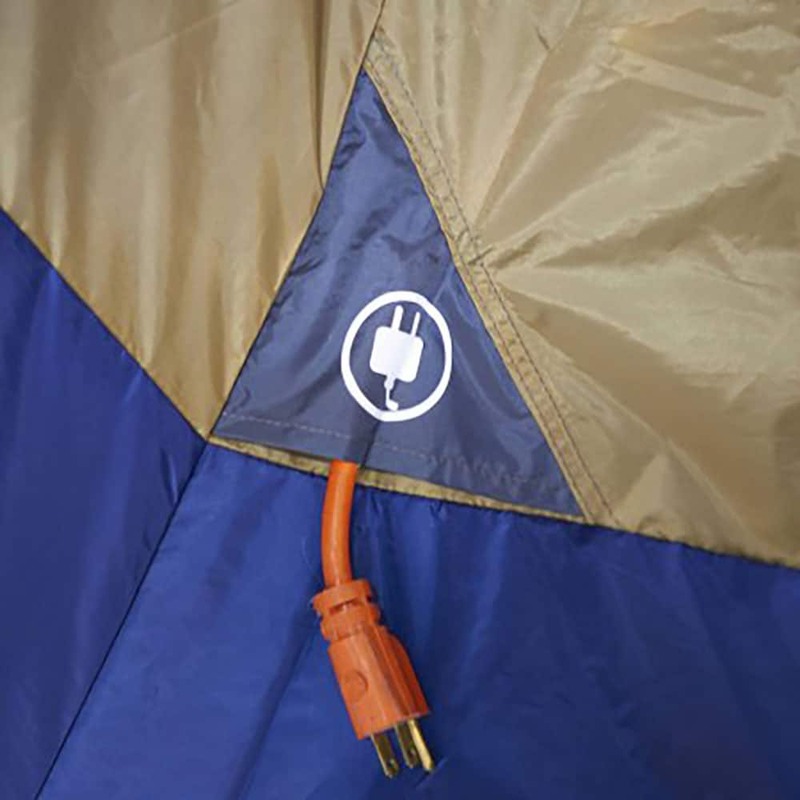 This tent is no exception. 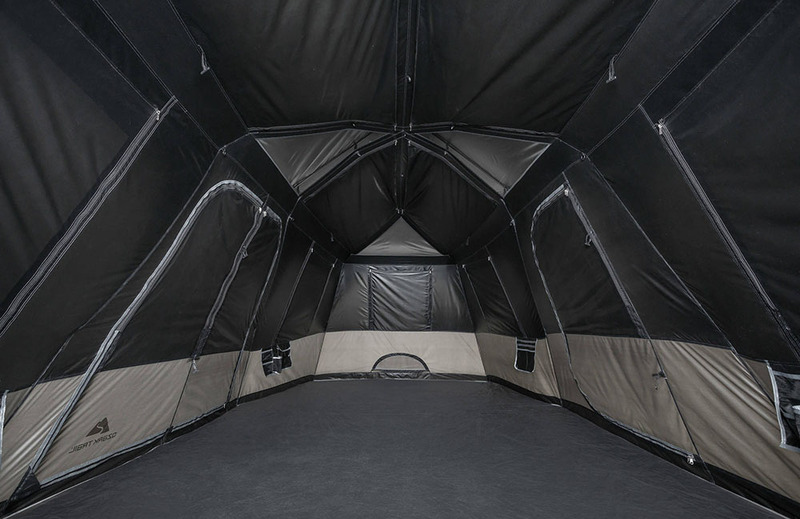 With floor dimensions of 17′ x 10′, there is lots of space for the whole family plus gear. 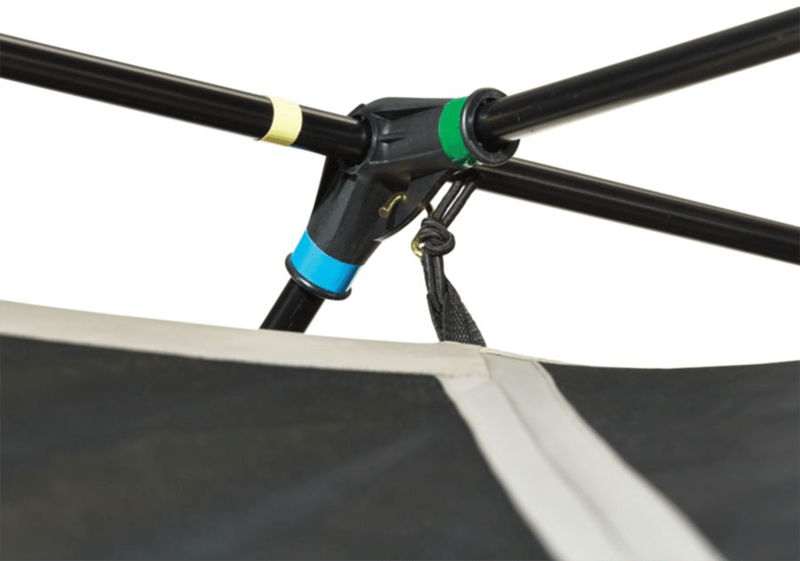 Colman also offers extra weather protection features like patented welded floors, inverted seams, and more. 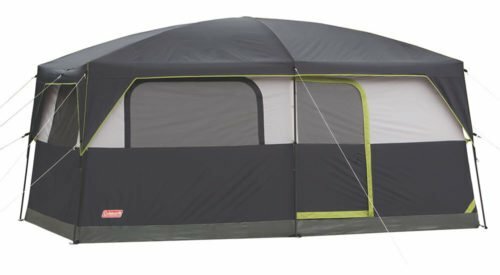 This tent is a solid and reliable option that is easy to set up, tack down, offers lots of space, and extra weather protection features. 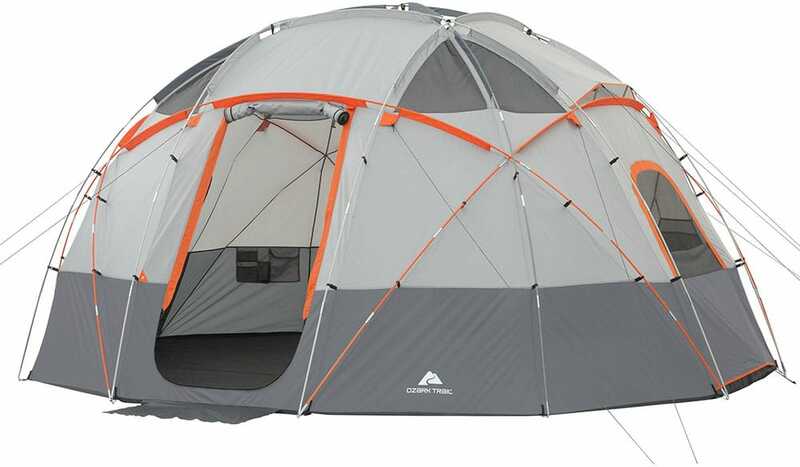 If you want a great reliable tent from a reliable brand, this is the tent for you. 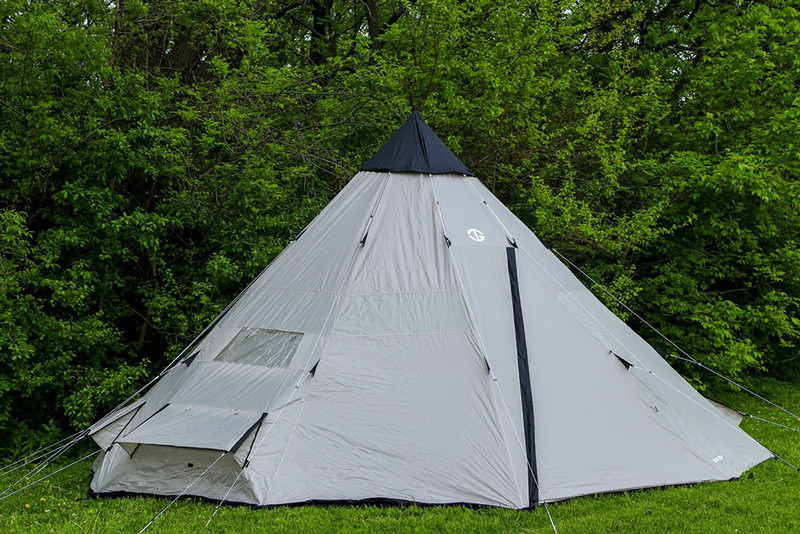 Ozark Trail’s 11 person hexagon camping tent is one of their tents with a slightly different shape. As the name says, it is in the shape of a hexagon. 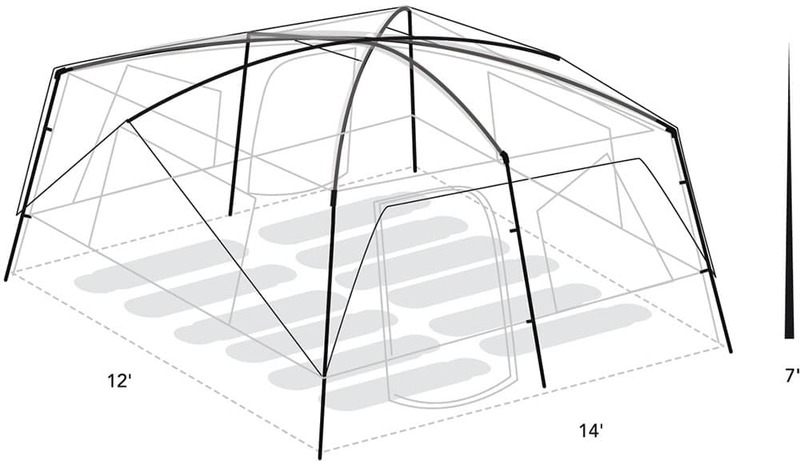 This is a large camping tent with floor dimensions of 17′ x 15′, which provides lots of space. 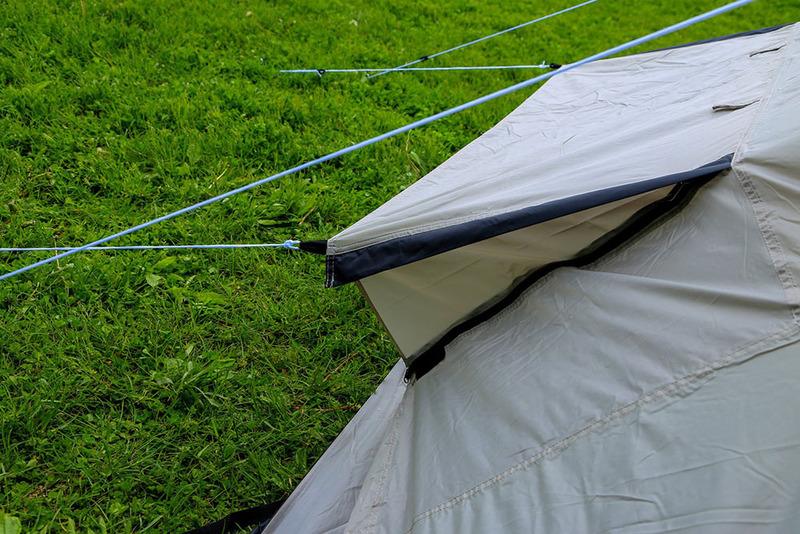 This is also an instant tent meaning that set up is very easy and can be done by one person in about 2 minutes. Additionally, the then has a shaded porch, which helps keep the entrance dry and clean. 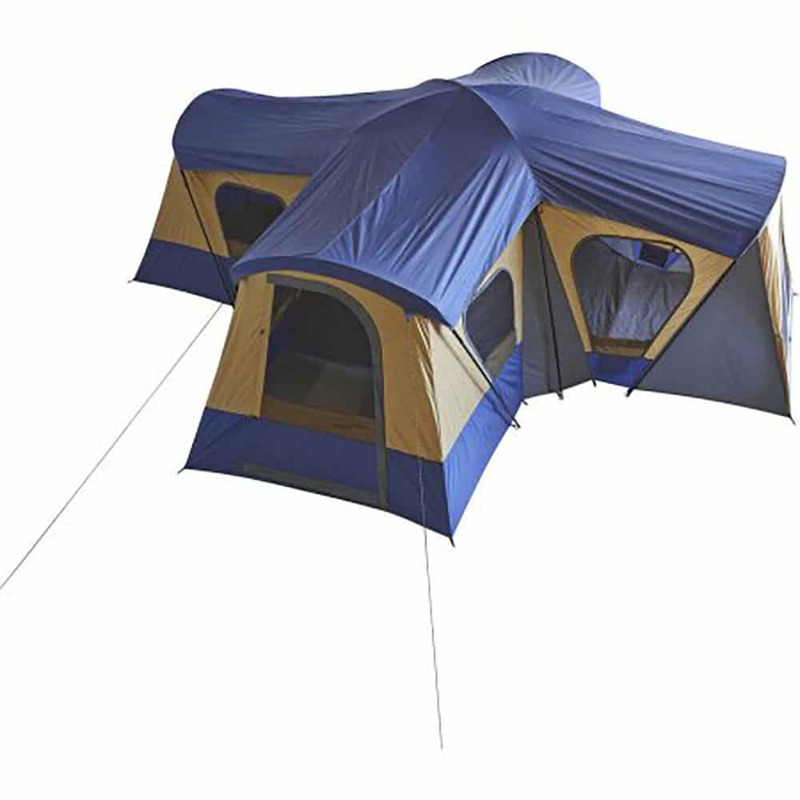 This tent is a slightly different shaped tent but provides lots of space for family and friends. 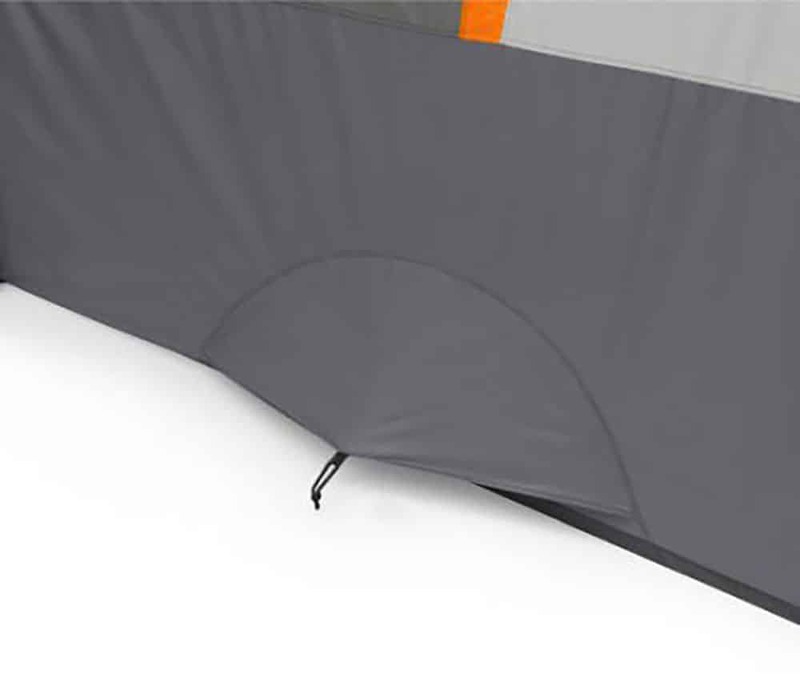 If you want to try something a little unconventional with an easy setup, this would be a great tent for you. 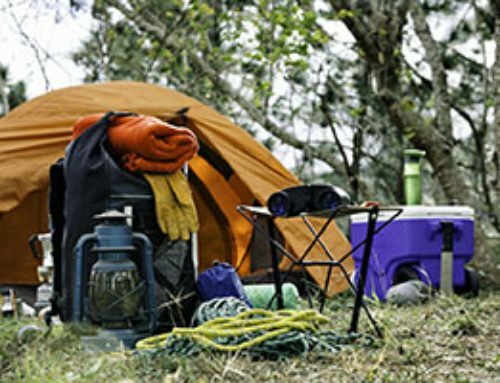 Now that you’ve seen the best large camping tents learn about how to find the best gear at the best prices. 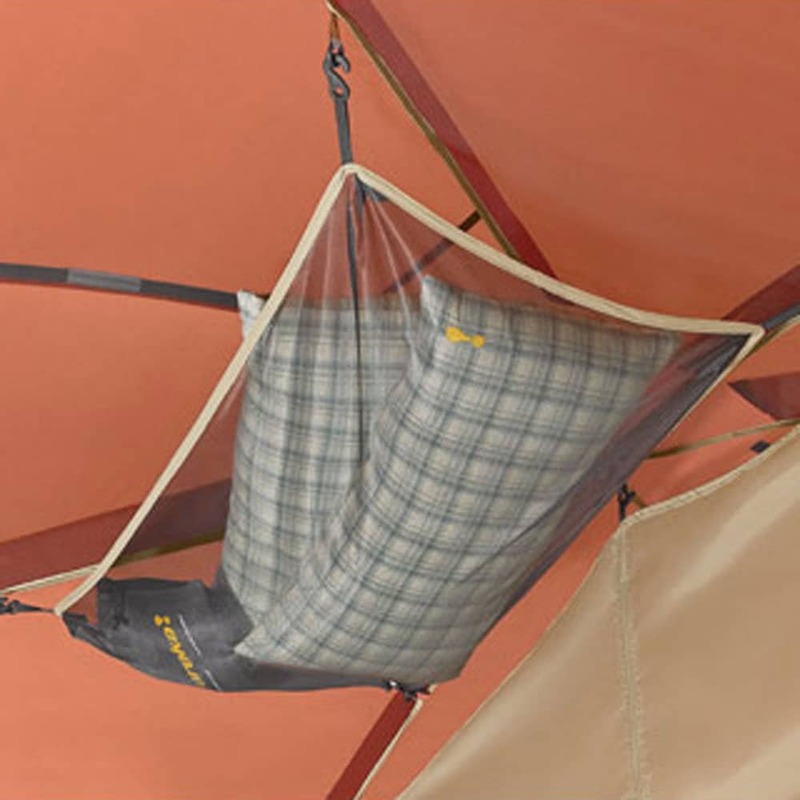 Also, learn more about the best ways to sleep better while camping.